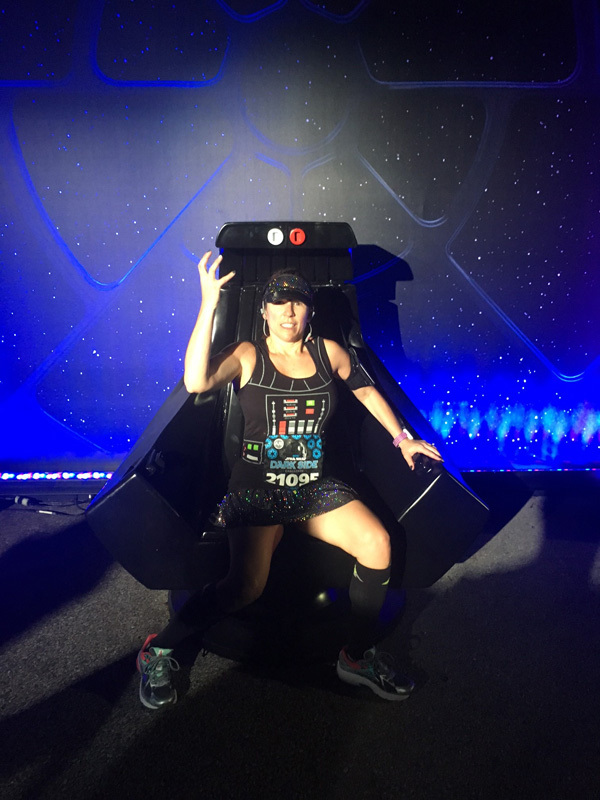 Heather is back with another character filled race recap! 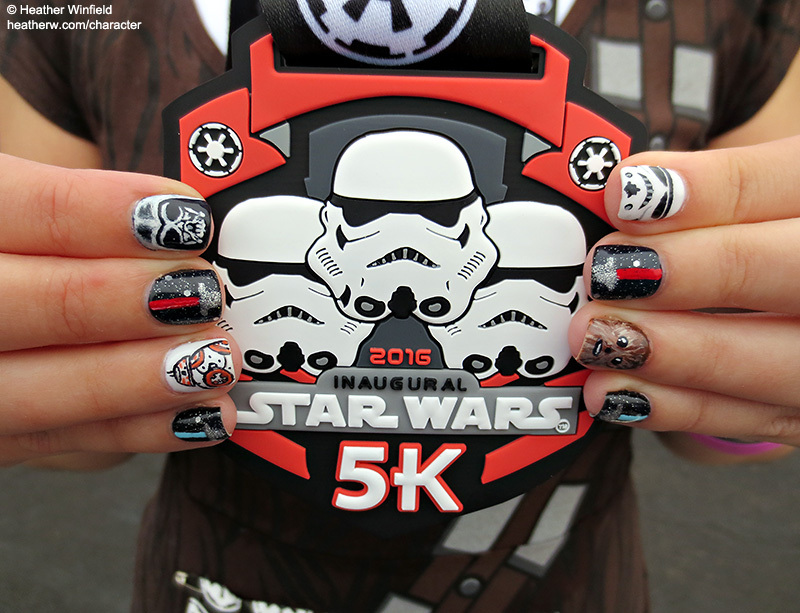 She’s taking us soaring through the galaxy at the Inaugural Star Wars 5K – The Dark Side. Let’s check out all the highs (and lows) from the race! 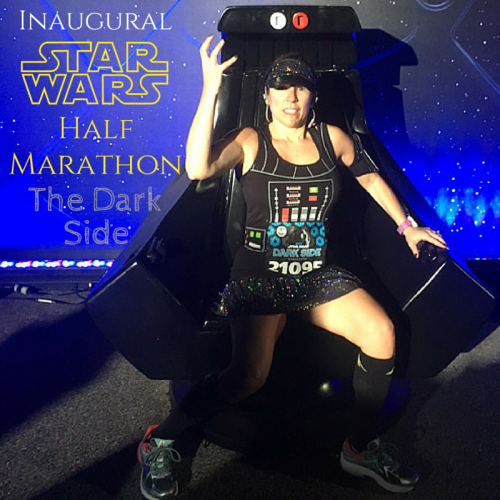 The Star Wars Dark Side was my 13th runDisney race weekend, and unfortunately, my least favorite. 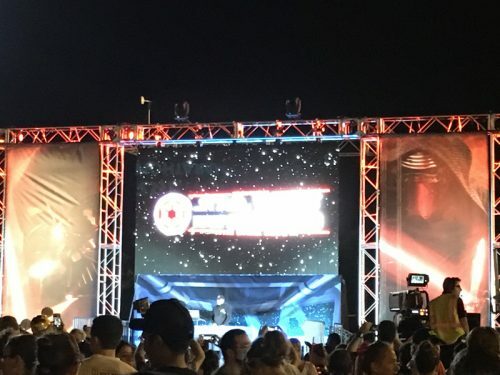 There were so many issues that, even as a huge Star Wars fan, I’m not planning to repeat it next year. Thankfully, I’m here to talk about the 5k, which was the best race of the three! The race started at 6am, with the first bus leaving at 4am. 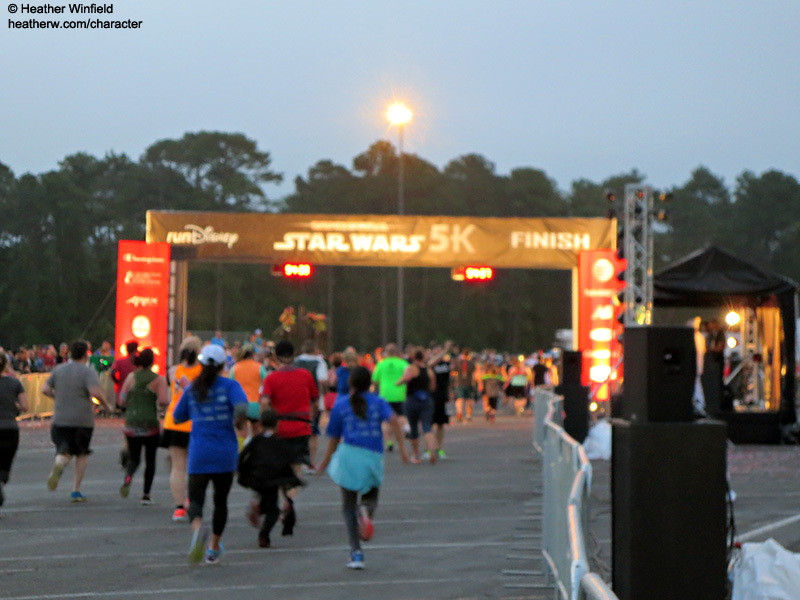 The start and finish area was in the Epcot parking lot, like most of the WDW runDisney 5Ks. As usual, there was a DJ to pump everyone up for the race, even though it was so early in the morning. With it being a Star Wars themed race, they showed clips from the movies, and also played Star Wars trivia with the crowd. 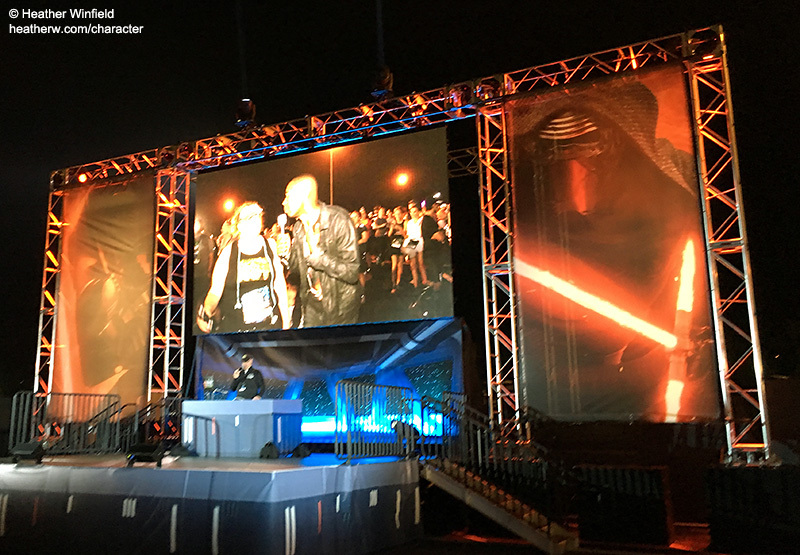 The stage also was well themed for the Star Wars Dark Side, with huge banners of Captain Phasma and Kylo Ren. I thought it was really cool that they had SO many characters out, and some pretty rare ones. This weekend was the first time ever that Captain Phasma and BB8 were meeting at WDW (BB8 met at the expo, too.) I had 2 issues with it, though. They had these same 6 (or 8, depending on how you look at it) characters out before and after EVERY race this weekend. So there was nothing new for one race once you had done the others. 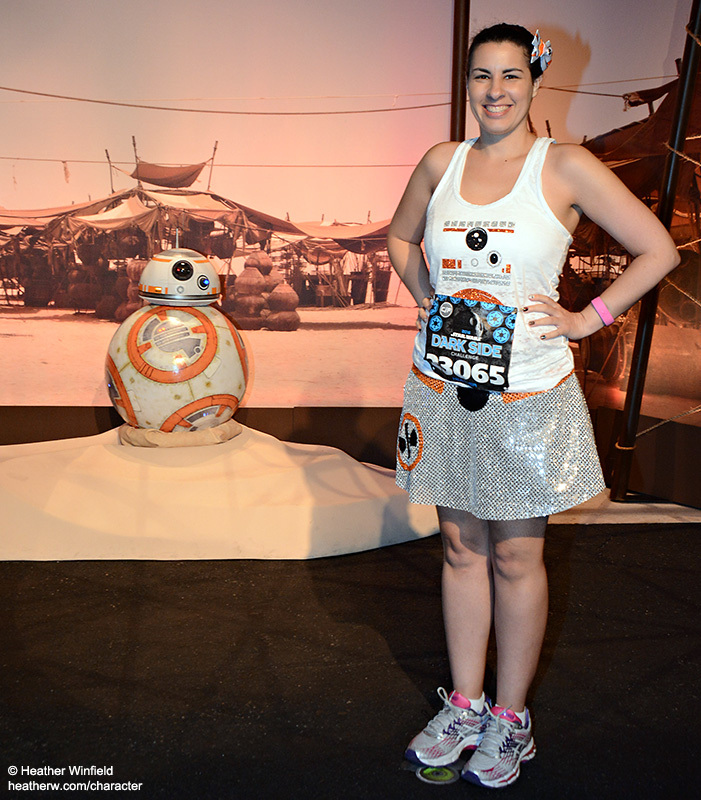 Here I am with BB8 before the half. The bigger issue was that they closed most of these characters lines REALLY fast. I’m a character person, so one reason I take the first bus to a race, and don’t mind the even earlier wakeup call for it, is that I know I’ll pass the time by waiting & meeting characters. I’ve never seen anything like how the character situation was handled before & after the race. Usually the characters will stay until at least when they tell you to leave for the corral. Maybe they’ll leave a few minutes before this, because they have to get to the starting line. 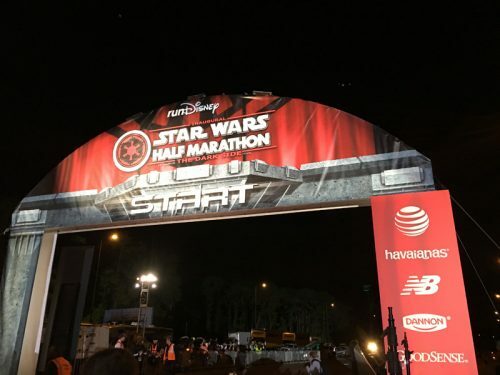 But I got to the starting area less than 30 minutes after the first bus picks you up (I was on the second bus), and the line for Captain Phasma was already closed. I ended up getting pictures with Jabba the Hutt and the Rathtar, since those lines never closed, since they couldn’t leave, lol. 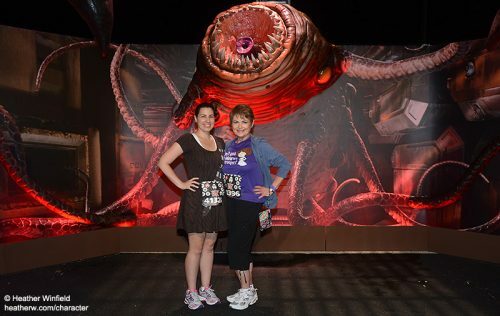 But even right after getting a pic with the Rathtar, the character attendant and PhotoPass left, and said you were on your own if you wanted to take a picture. And it was only around 5am. I know this post is about the 5K, but the 10K was even worse. I was on the first bus, and EVERY character line was closed. It was ridiculous. I was able to meet several after the 10K, but if you weren’t in an early corral, a lot of the lines were closed quickly after the race too. This wasn’t the character attendants fault, but I saw plenty of runners taking it out on them. 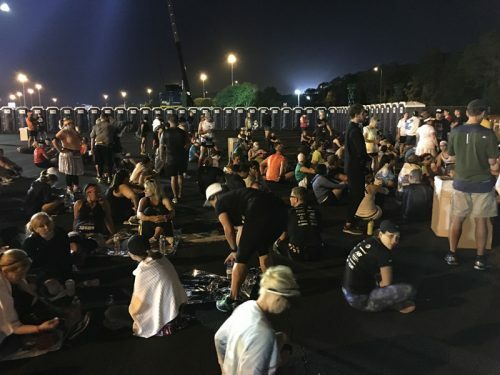 🙁 By the half, they didn’t end up closing the lines before the race, and would say when the character had to leave, but at least they gave you the chance to wait. The whole situation is something they really need to figure out for next time. After getting what pictures we could get, I headed over to the corrals. I was in corral A, which obviously is great! They moved us a little after 5:30, which felt really early to me. I had on a throwaway sweatshirt, like I usually do in the corrals, but it was pretty hot & humid, so I didn’t really need it. 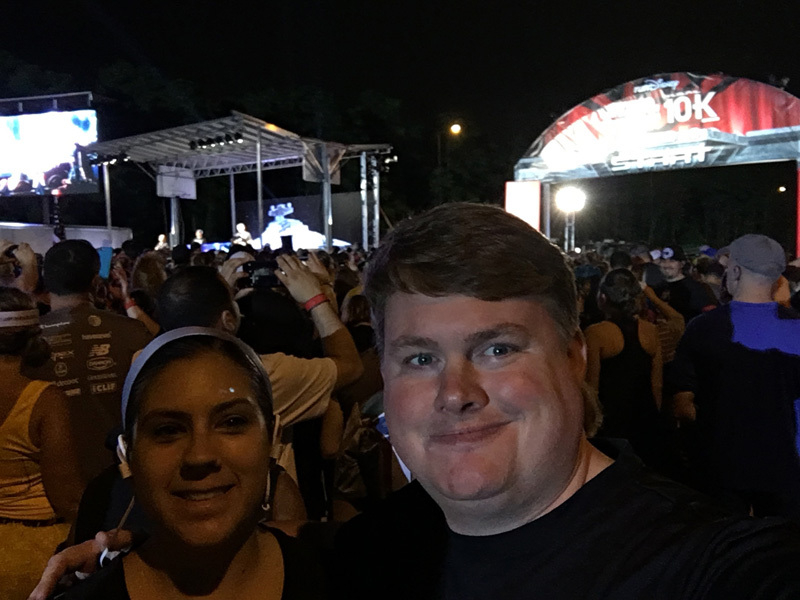 Around 10 minutes before the race, it was already 68 with over 90% humidity. I really don’t do well running in the heat and humidity, so I was glad it was just a 5K, and hoping it would cool down over the next 2 days! 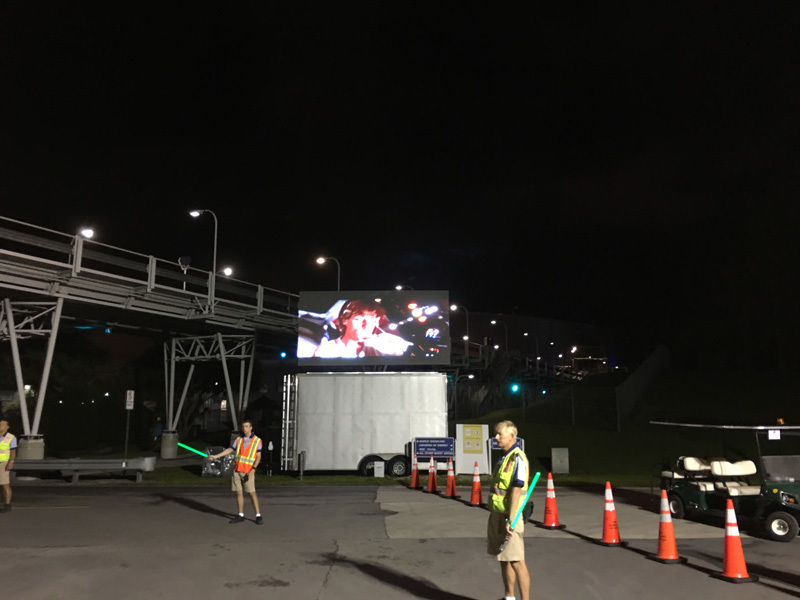 The best part about waiting for our corral to go off was that they played the original trailer for the original Star Wars movie! 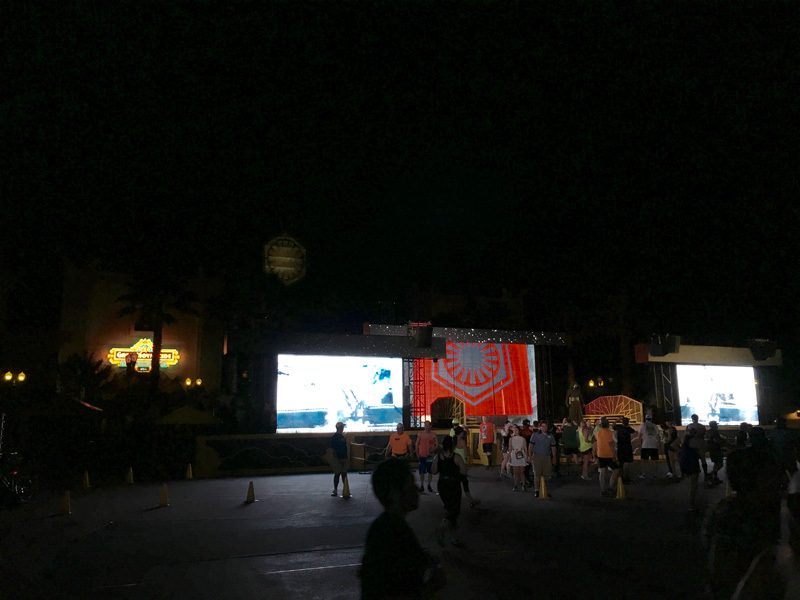 The course was almost the same as the typical WDW 5Ks through Epcot, just slightly different. Instead of going around by Imagination, we just kept running straight towards Spaceship Earth after the World Showcase, running under Spaceship Earth before leaving Epcot. I always love running around the World Showcase, so I really liked the course. The first mile and a half or so was outside the park. 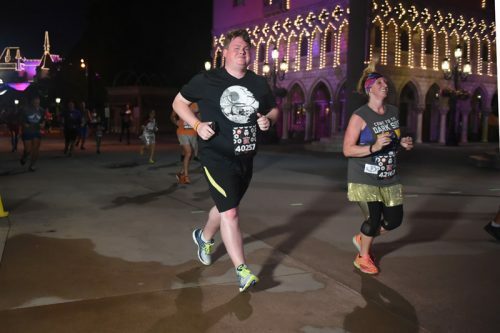 Usually there’s a character spot before the first mile on this part of the course, but instead, they only had a backdrop with an AT-AT leg, which was disappointing. I didn’t stop, and only saw two people there when I passed by to take a picture. Just after entering the Epcot backstage area, R2D2 was meeting. It was a strange area to have such a large line, they even had a cast member yelling who was meeting as you ran by, since it was hard to see. 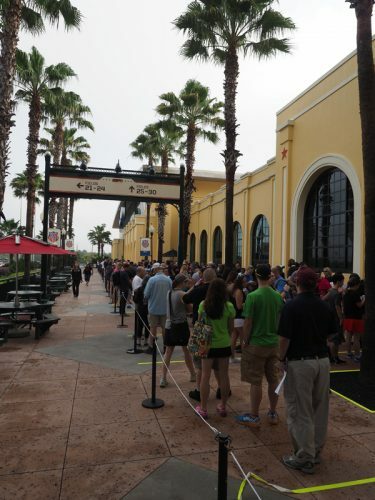 Even being in corral A, and not stopping for anything, the line looked pretty long. And not knowing who else would be out, I skipped him. I later regretted this, since the characters over the 3 races were not good (the 10k only had TWO, both of whom were on the 5k), and his line grew even worse over the next 2 races, so I didn’t stop then either. Once we entered the World Showcase, Star Wars music played! 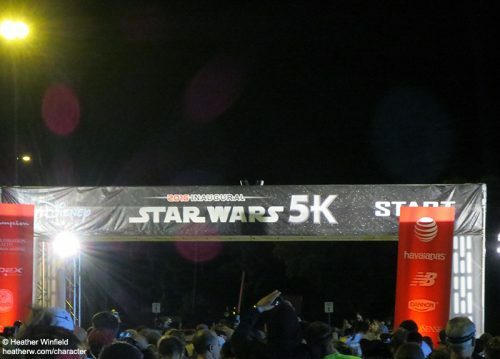 If you can’t get hyped up to run while listening to Star Wars music, I don’t know why you are doing a Star Wars race! They had all the pavilions lit up pink, which was odd, though! They did this for the princess races, and the pink made sense then, but not here. 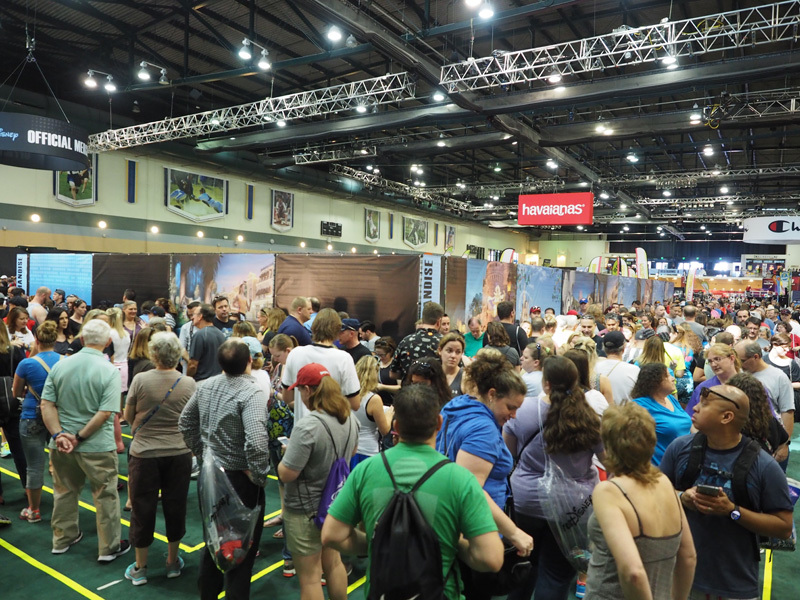 This race weekend was the first time PhotoPass was used for the race weekend instead of MarathonFoto. 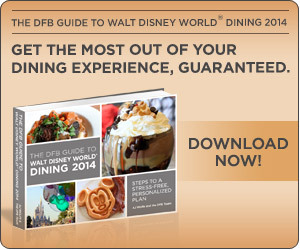 I was really excited for this since, as an annual passholder, PhotoPass pictures are included. And I’m such a picture person, I almost always would buy the MarathonFoto pictures for each race, so this will certainly save me money! In the official guide and on the back of your bib, you are given a code and then you add your bib number to the end, and you enter this into the My Disney Experience App, or the PhotoPass site. I didn’t have any issues with it during the 5k, and my pictures started showing up in the app around 1:30 pm! Most of the running pictures looked much better than the MarathonFoto pictures, so I was happy with that too. 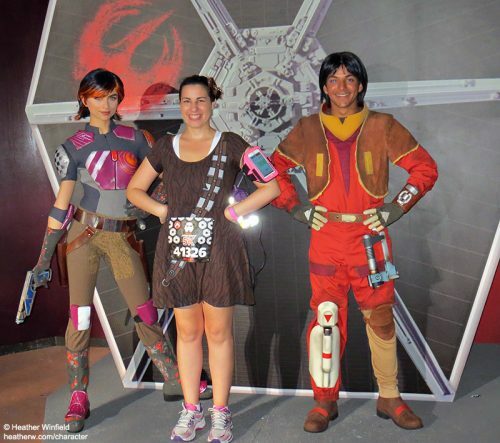 The second character spot was in America, where Ezra and Sabine from Star Wars Rebels met in front of a cool backdrop. I’ve met them before, but decided to stop. I didn’t wait too long, but I took this picture of Spaceship Earth lit up while waiting. The Illuminations torches were all on, too, always a highlight of the races that go through Epcot. 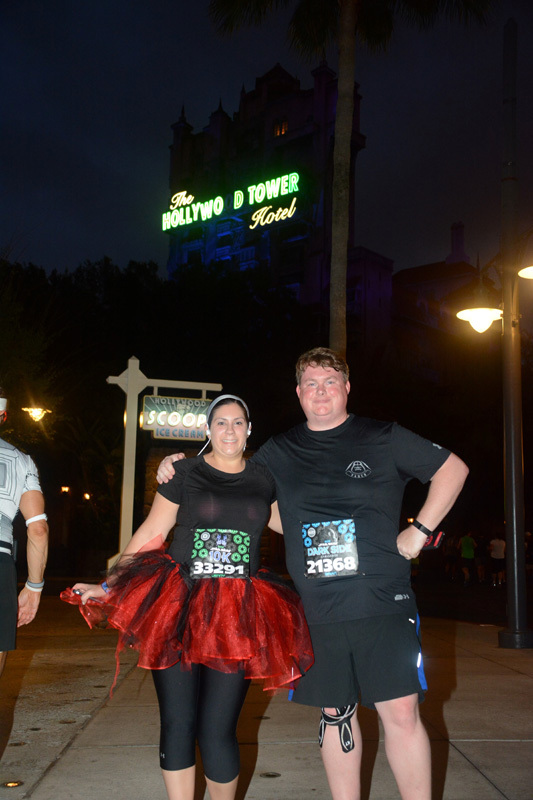 While the running PhotoPass pictures came out well, the nighttime posed PhotoPass pictures didn’t seem lit enough. My picture with Ezra and Sabine was really dark. This picture was from my camera. We continued running around the World Showcase. 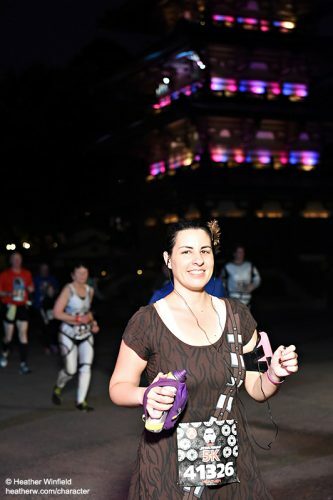 Here I am running by the lit up Japan pavilion. I normally only carry water for a half, but it was SO hot and humid, I decided to carry water for the 5K, and I’m really glad I did. 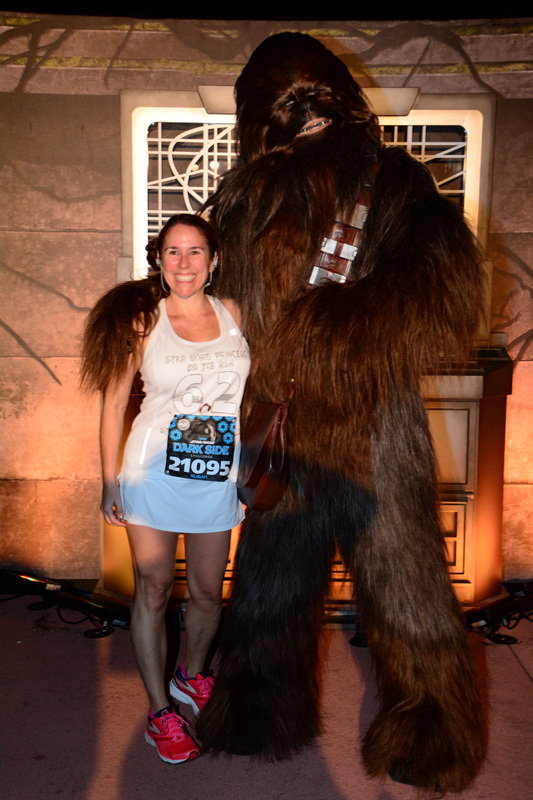 Chewie was the last real character spot during the 5k, so there were only 3 spots, which was disappointing. Usually a race that goes around the World Showcase has several character stops in the World Showcase alone. 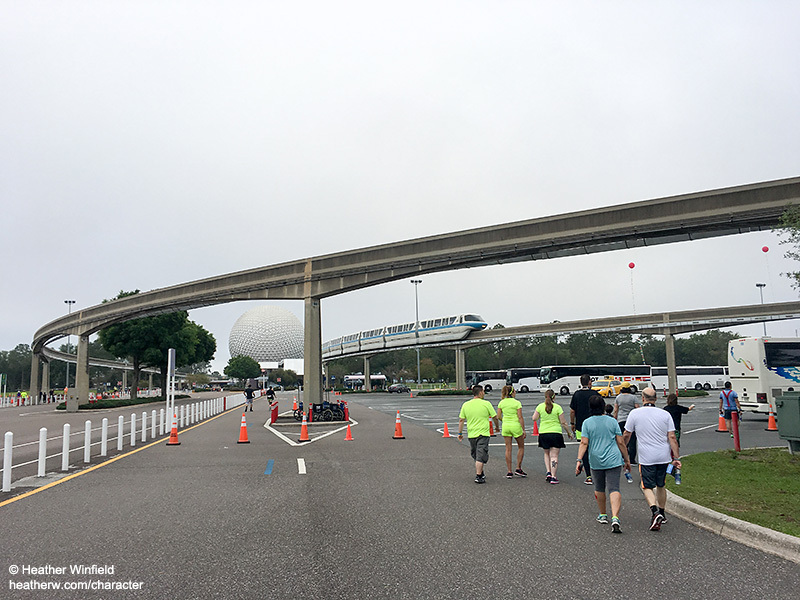 We then ran back into Epcot, entering by the UK, around the World Showcase towards the entrance from Future World. 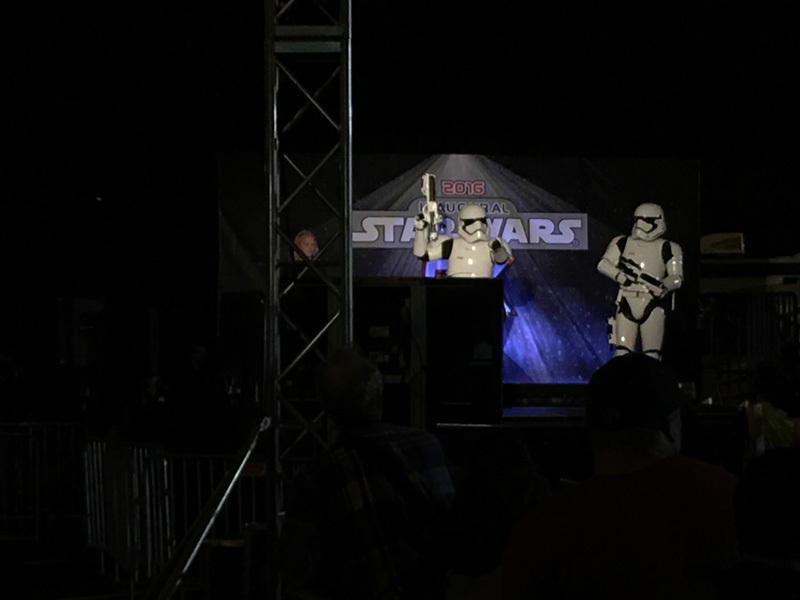 On the stage in front of Spaceship Earth, they had Stormtroopers. There was a line, but they were on a stage, so I don’t really count them as a character stop. Even so, that’s only 4 character spots for the race. 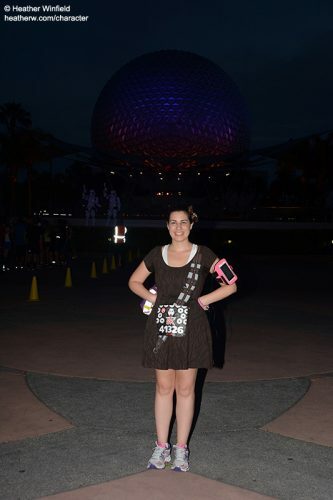 They also had PhotoPass around here, to take a picture with Spaceship Earth behind you. I decided to stop, but when it was my time to get the picture, the head PhotoPass photographer told the two photographers to switch their settings to daytime settings. I immediately knew the picture wasn’t going to come out since it was still very dark out. What bad timing 🙁 You can hardly see anything behind me. We continued down to Spaceship Earth. They had several Photopass in a row set up after Spaceship Earth, for while you ran under the ball, which was cool. 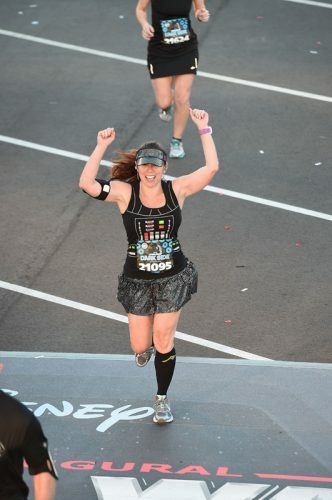 I love this pic of my mom running near the finish line. Especially since I don’t look happy in any of my pictures around the finish, haha. And the finish line is near! The 5k medal is really cool, I love it! After the race, the medal picture setup seems different than with MarathonFoto. It felt like there were a lot more photo lines than in the past, so the lines weren’t that long. However, the backdrops were all runDisney generic. Since they were just as generic at the Tinker Bell races, I figure that will remain the case for all races now. They do add a border for that race, but then your bib is covered and it’s harder to edit the picture (which I need to do because the color is off.) Also, they originally had the 10k border on my picture, and I had to contact them to fix it. I’d rather have the themed backgrounds. Also, I usually ask the person behind me to take the medal picture on my camera. For the 5k, the PhotoPass photographer said he could take it. I thought, great, I’ll never have to ask someone behind me to take the picture for me again! 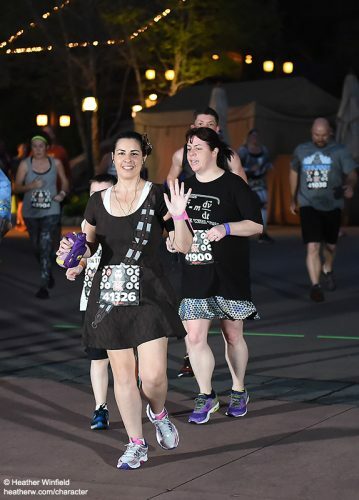 So after the 10k I didn’t, and the PhotoPass said she couldn’t take it, so I quickly asked the person behind me, and I know they weren’t prepared, so that picture is a blurred mess. 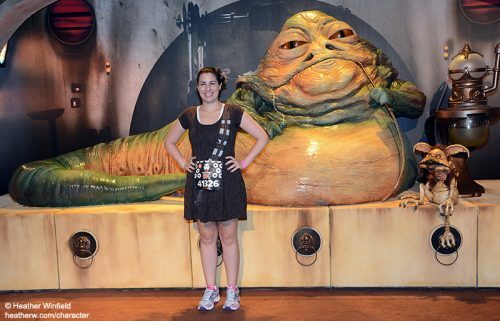 And of course, PhotoPass lost my 10k medal picture. 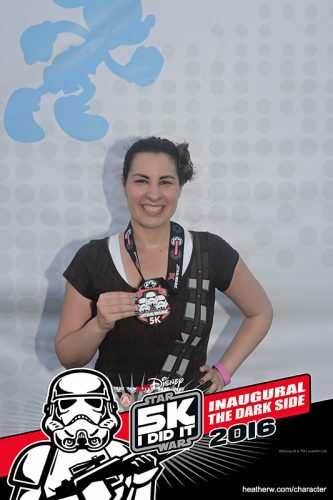 So, for the first time ever, I don’t have any kind of official medal picture for a race. 🙁 The Photo pass photographer after the half was really rude to me. I had fallen early during the half & was in a lot of pain, and I just wanted a picture, and she was so nasty, that the person behind me refused to take the picture on my camera. 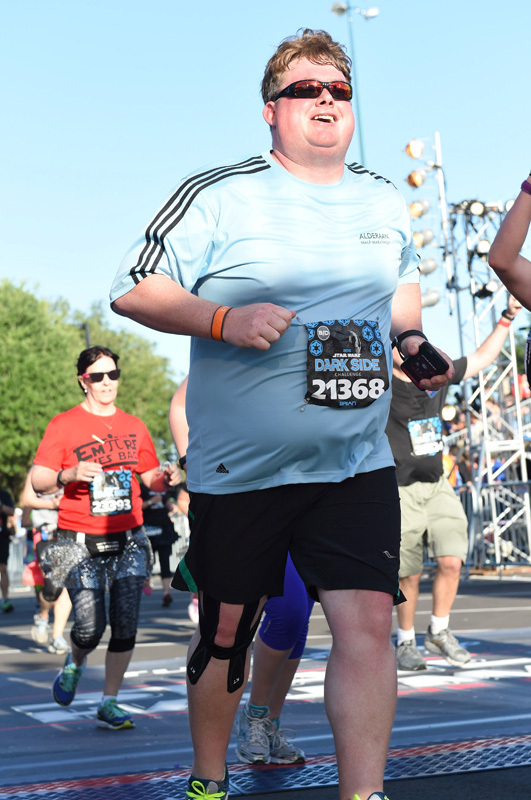 Plus, for the half, I didn’t have ANY running pictures show up. There were lots of issues with PhotoPass because of the race weekend (it kind of crashed the whole system), and I finally got some pictures weeks later, but I know there should be more. At least with MarathonFoto, you could search unidentified pictures to find more of you during the race. I know these weren’t all issues during the 5k, but since PhotoPass will be doing races from now on, I thought it would be important to note the kind of issues I had with it during the race weekend. Hopefully these issues will be fixed over time, but I wish they had rolled it out slowly, testing it during one race instead of a full weekend. 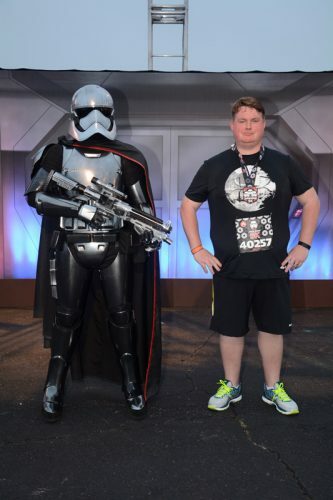 After the race, I went to get in line for Captain Phasma, since her line was closed before the race. I ended up waiting over 40 minutes, almost as long as the 5k, haha, but it was worth it! She’s so cool! Here’s the other characters that were out, from when I met them after the 10k. The bus line after the race is usually right in the finish area, but this time, it was a long way away. I wish I had checked my FitBit to see exactly how long, haha! It didn’t help that we didn’t know exactly where we were going, so it felt longer. 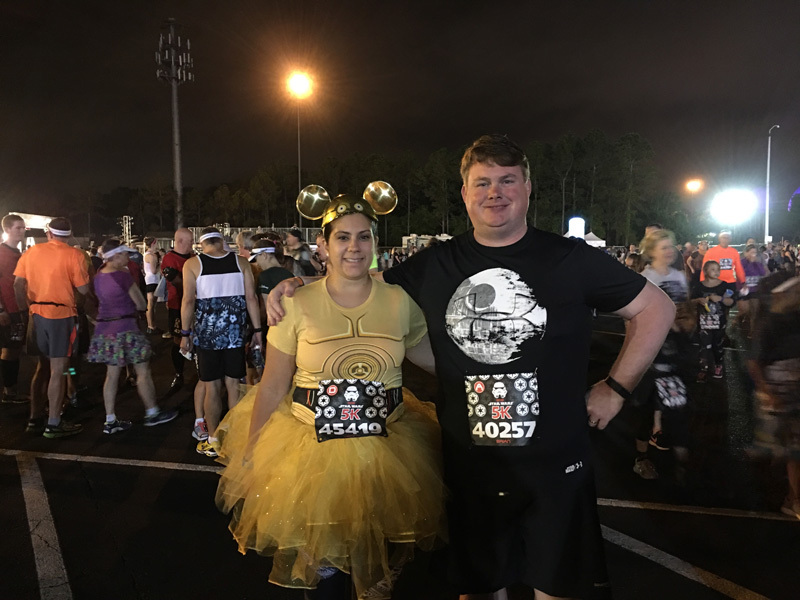 Another fun runDisney 5k in the books! Woke up with a little Vader in me, ready to officially start the Dark Side Challenge with the 10k. Arrived at the buses around 3:30, and again the buses arrived efficiently. Before we knew it, we were at the race staging area very early. One of the strangest things we encountered the whole weekend was, the Dark Side Characters (Darth Maul, Boba Fett, Lord Vader, Captain Phasma, and First Order Troopers) lines were closed when we arrived. 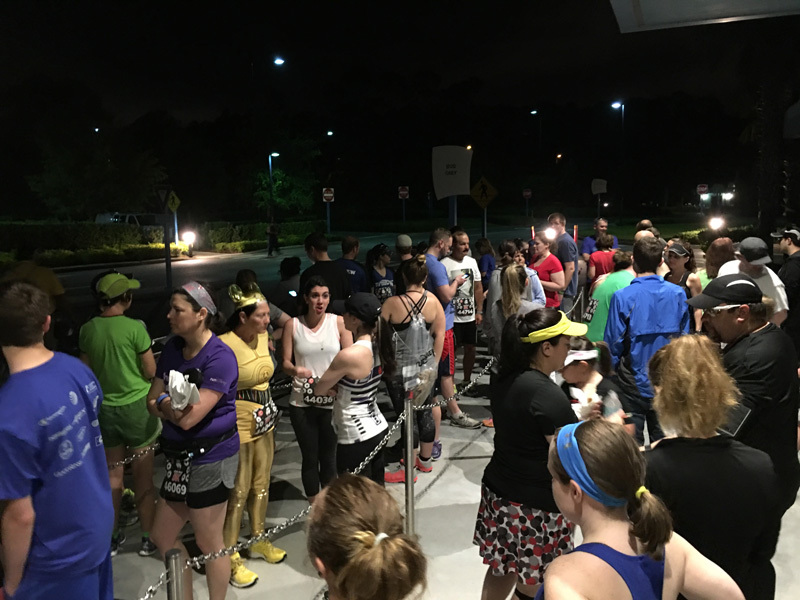 At 3:55am the Character lines were closed, more then an hour and half before the race started the lines were closed. We were on the first bus over, we didn’t even have a chance to part take that morning. Very shocked and disappointed in this situation. 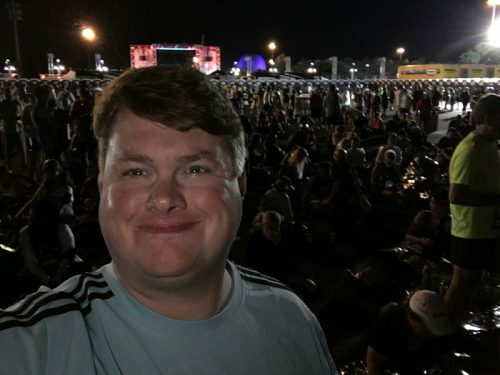 About 4:20am the DJ announced that everyone was to report to their respecting corrals. 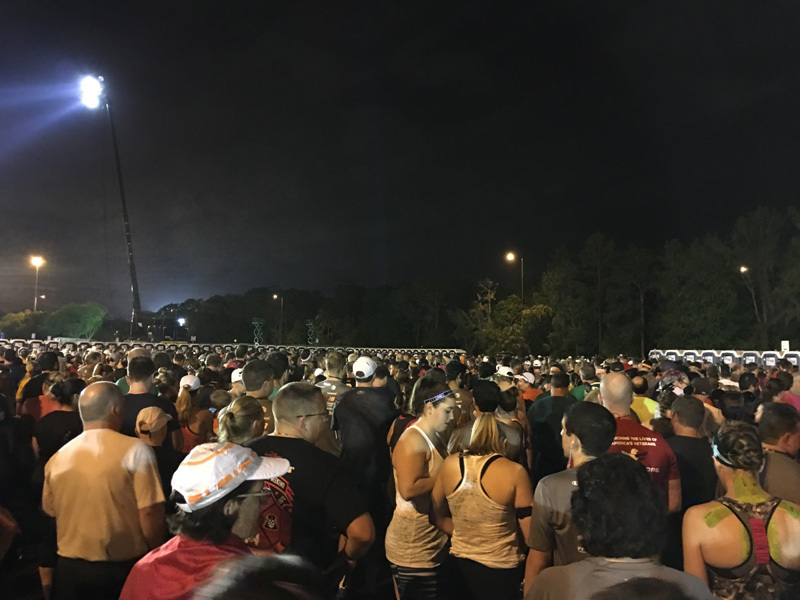 We walked over to the corral staging area, and it was insanely crowed, almost over crowed. The runners then started down this cramped paved path to the corral area. Almost a quarter mile in back to back runner traffic, and it took us almost 25 mins to get back there. 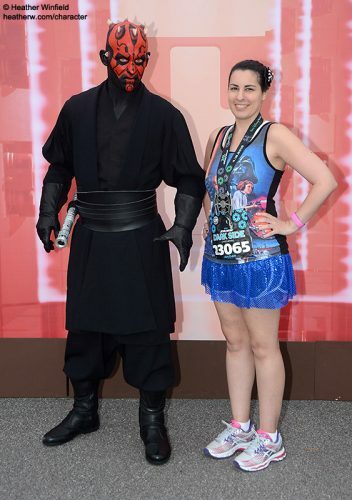 Corral A Starts off the Star Wars 10k with Sith fashion. Got to run with my favorite person in the world my wife, Jenny. Rudy and John did a great job with announcing again for the 10k. Before we knew it, he called out 30 seconds, and we were off. 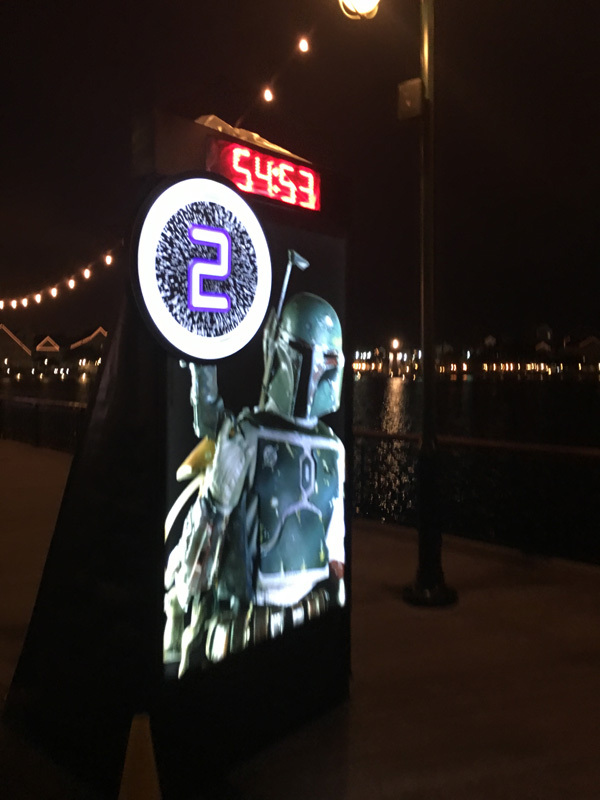 Boba and the Boardwalk greets us at mile 2. 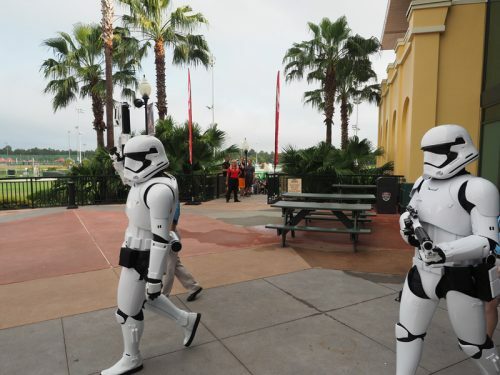 Running into the Studios, we were meet by the 501st Legion. What an exceptional job by these gals and guys. 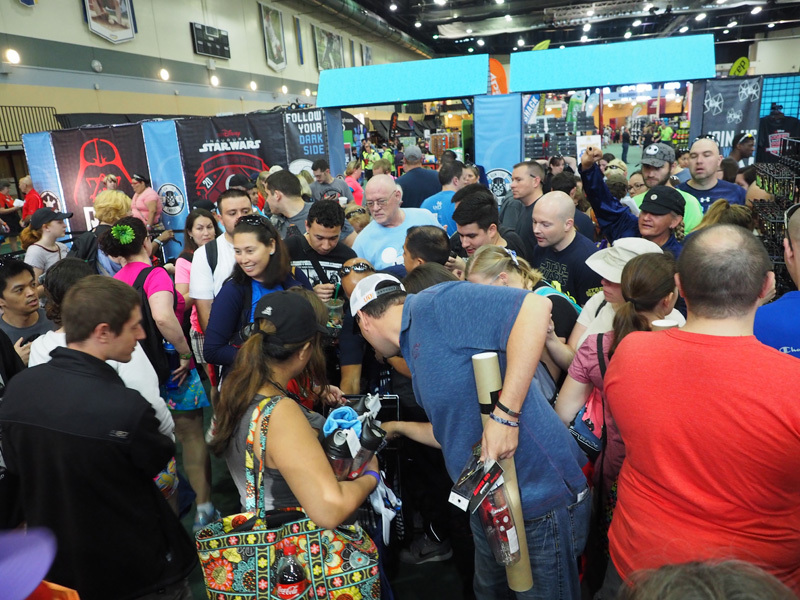 Mandalorian members of the 501st. Jenny looking all Princess Sith’d out coming down Hollywood Blvd. She hand made these, and they outshine 99% of them on the course, great job babe! 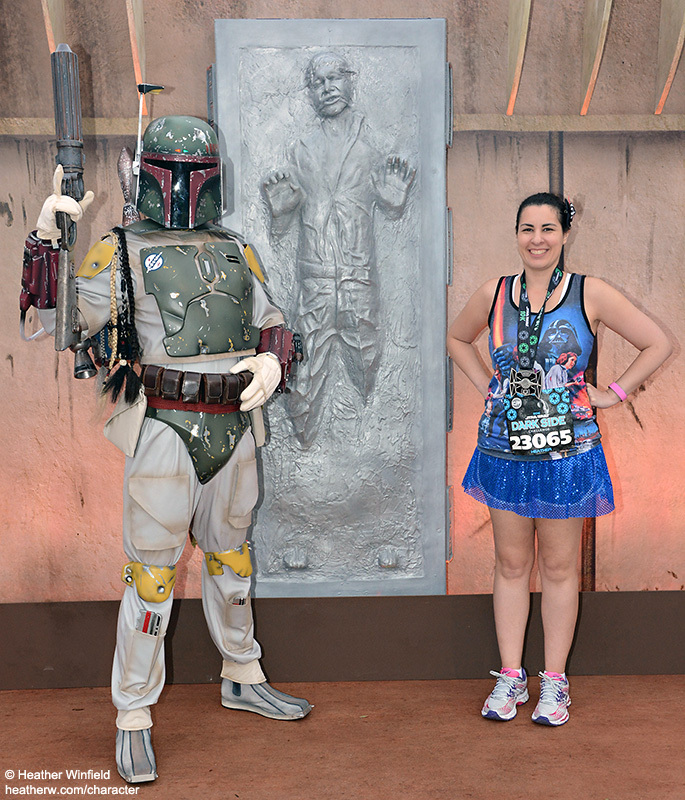 How could would we resist this photo opportunity; furthermore, I would like to congratulate Disney on a great job with the new photo pass system they have in place for these races. So much more convenient than before. 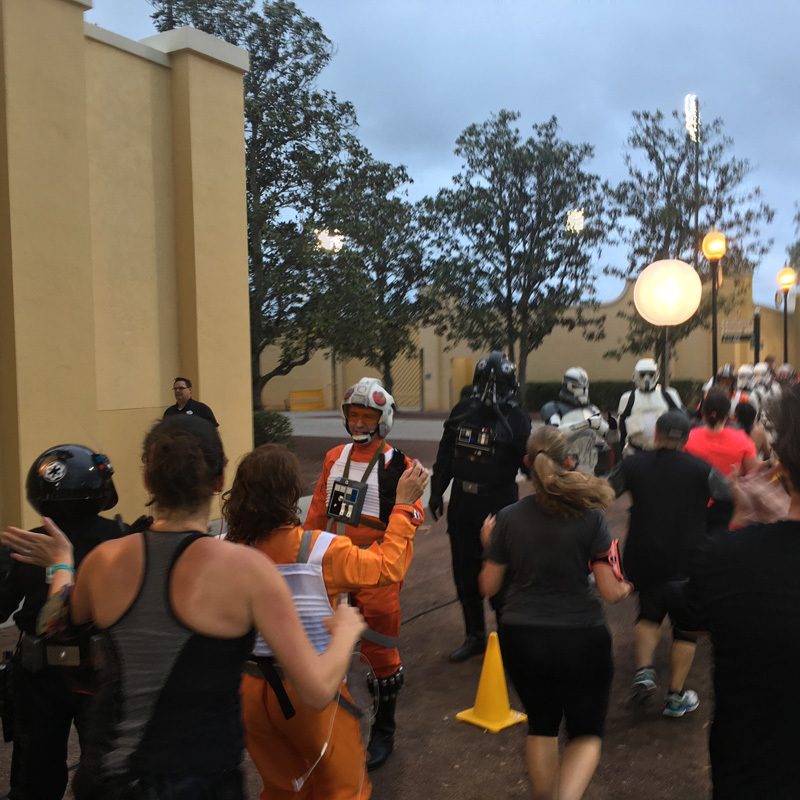 Heading towards the finish line, the 501st was present giving out high fives, where else are you going to give high fives to 40-50 imperials? 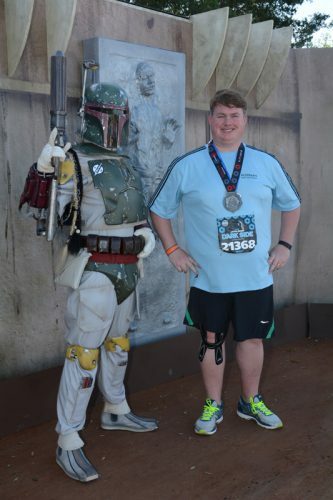 The 10k was really nice, and felt much more challenging then the Princess/Marathon 10k. Heading from Epcot World Showcase you went by the Yacht and Beach Club Resort in the little path that leads to the studios, this part of the course was extremely narrow, which resulted in some frustration. All in all, the course was a really nice run, with ample water stops. After the medals – we exited into the ESPN WWoS complex’s parking lot. This parking lot had been retrofitted into a bus depot for the weekend. 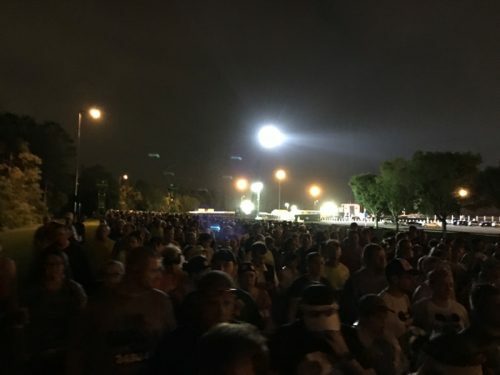 We didn’t have that bad of line waiting for Art of Animation, but the runners who had parked at Epcot, that line was a completely different story, it was massive. Thanks for a great 10k race runDisney team. 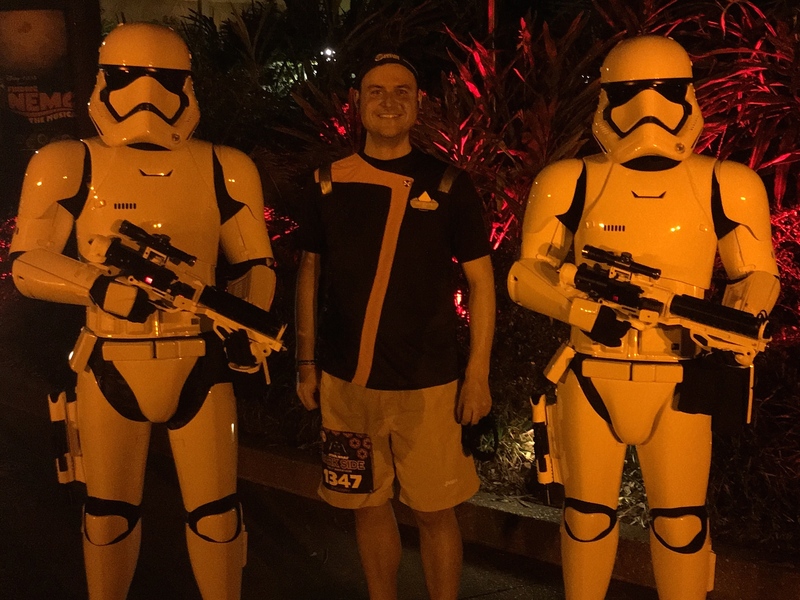 Second Storm Trooper test done, on to the Half Marathon..
Alarm went of exactly at 2:30am… Bursted out of bed with excitement, this was the day I had been waiting for close to a half a year, Star Wars Half Marathon, the Dark Side. Above is a shirt I made for this race, some people didn’t get, but the fanboys like myself, loved it. I was at the bus stop for the first bus, which was half full at best. Listening to a few people, most people forgot that this race started at 5:00am instead of the usual 5:30am. Arriving in a very timely fashion at the race start, all the veterans from the previous day, headed right to the corral waiting area, smart idea, the same thing happened at the Half Marathon that had happened at the 10k, bottle necked. I was at the front of the madness. Smiling because its 3:45am, and its almost one hour till the launch for corral A and the start of the Dark Side. Exactly at 5:00am, the Star Wars Half Marathon – Dark Side – had started. Fireworks were amazing and completely up lifting. Corrals moved very fast to the start line. The start line, still gives me goosebumps. We were moved up so quickly vs other races, that before we knew it. Rudy gave out the “30 seconds” call, and then “Runnnnnnnners…. SET…… G0000000oooooo) And I was officially running past the start line on my way to finish the last leg of the Dark Side Challenge. As I stated in the 10k review, I start the race, something gets turned on, and I am in the zone, I didn’t stop for many pictures, probably should of, but the nerves of this being my second half marathon, I just didn’t want to test fate. Next year I promise I will be more proactive in photo chasing. This picture was taking coming down Hollywood Blvd and turning left towards Indiana Jones Epic Stunt Spectacular. I never ran that way ever, nice change. 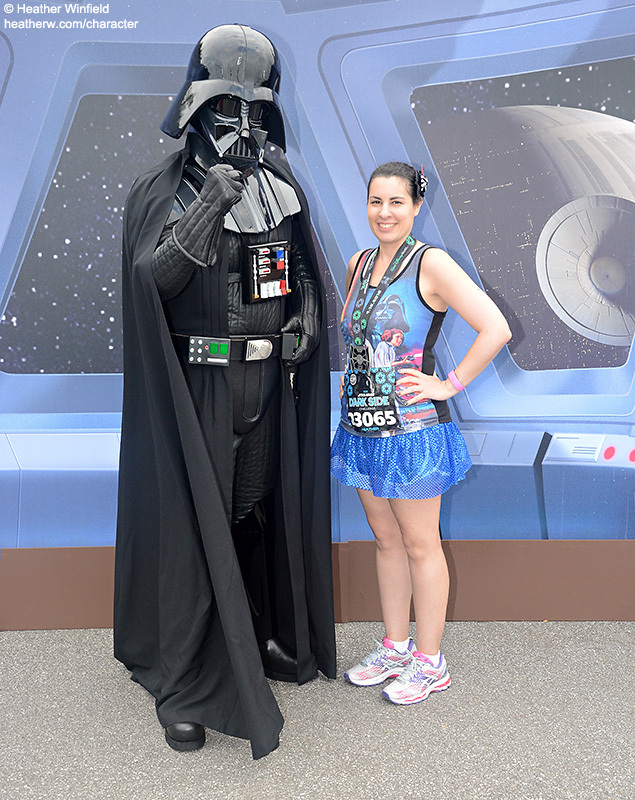 Kylo Ren was out displaying his ‘Dark Side’ and had a temper tantrum as I ran past, ohhhh Kylo,,, see you later for a four medal picture. 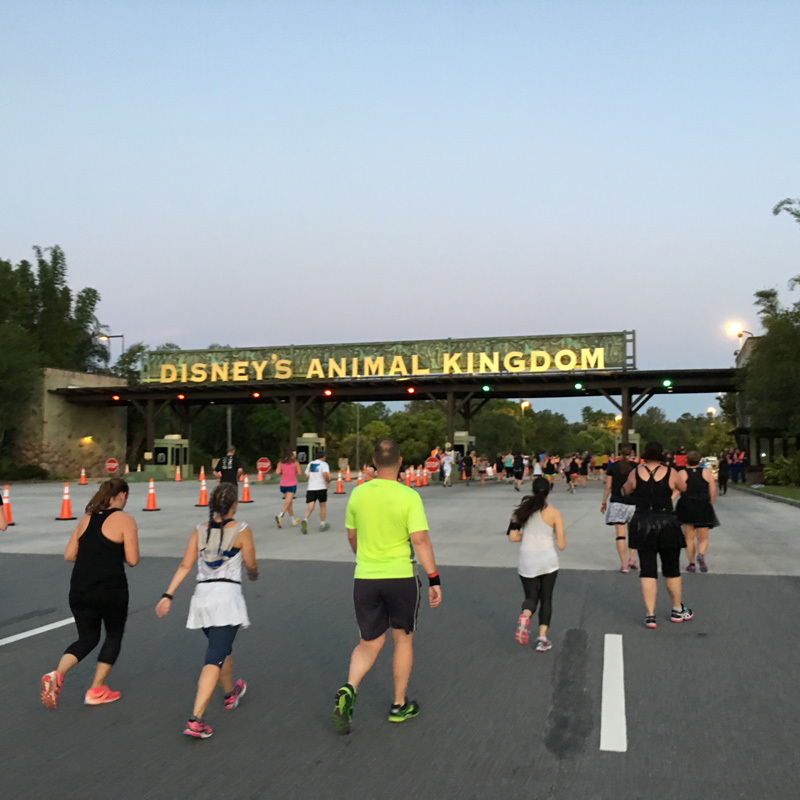 Heading into Animal Kingdom, I still had an amazing amount of energy left, I felt better than I did for my previous half marathon. Turning towards the parking lot of AK, yikes, we had to run the full outside loop of the lot. Hit mile 12.0 and was hit with so many great supporters that really recharged the fuel tanks for a final push. 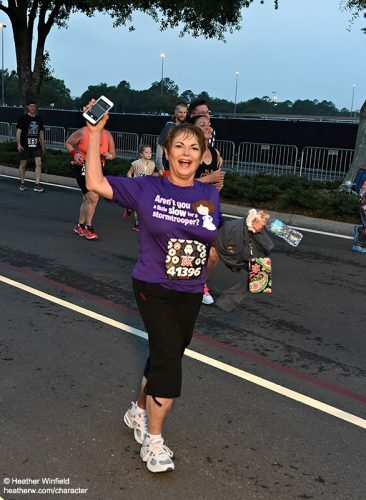 I saw Jenny,,,, Stopped and she gave me a hug, I started to tear up, she said ‘Go – see you at the finish’ Off I went, started to run hard, using every bit of energy I had, its amazing how quickly it disappears. 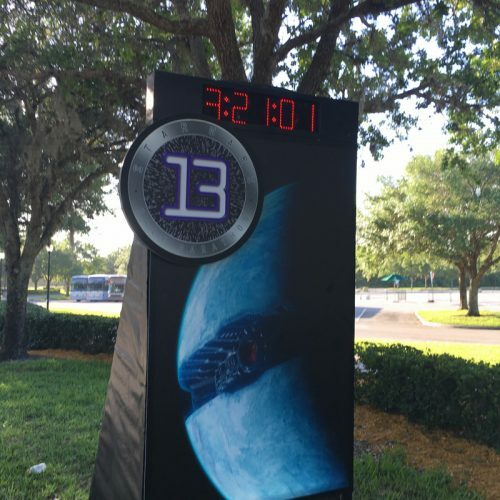 As the last drop started to be used, MILE MARKER 13 was there, and the finish line was just in sight. Approaching the finish line, you could hear the roars and cheers from the gallery as you enter the final bend. 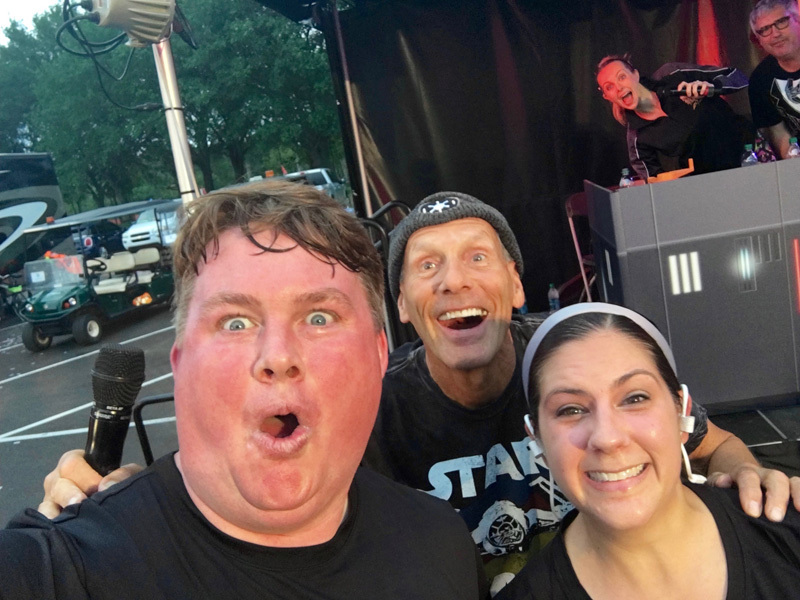 Rudy, Carrisa, and John were welcoming runners to the finish line, and something happened to me that has never happened in over 12 runDisney races. Passing by the announcers, Rudy let out a big “Here is our good friend Brian Meljac, Congratulations” The smile on my face went from happy to breaming, and I pumped my fists up as I past them. 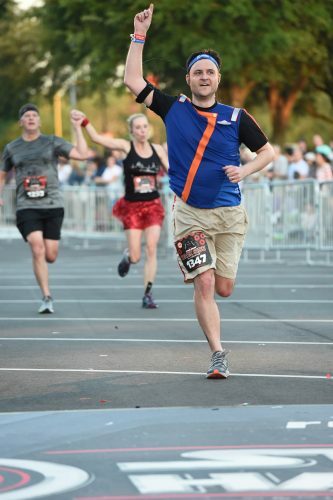 Rudy came down, pointed to me and said “you make me so proud” as I crossed the finish line, this made me tear up then, (and a little as I am writing this). What an amazing feeling. Thanks for all the support from the cheering crowd, Rudy Novotny, John Pelkey, my beautiful wife, and of course all of the amazing volunteers. I am officially a Dark Side Challenger, having done 22.4 miles in three mornings that morning, I never would have imagined in years past that I would be able to complete such a thing. The running bug has hit me hard, all I can think about is the next race and the training to achieve more distance and better timing. I look forward to a great many things this year, and next year where I continue my legacy as a Star Wars Dark Side Legacy runner. See you all on the pavement. 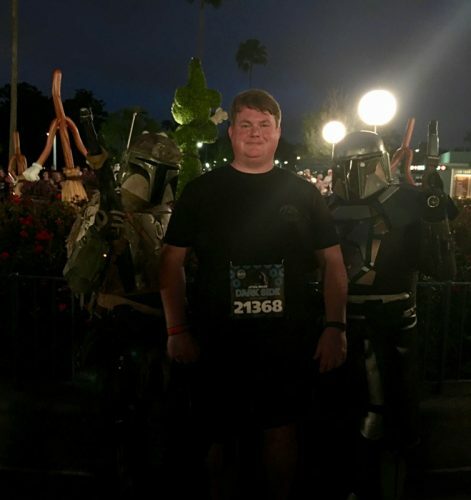 Visit Brian Meljac’s personal blog, Dark Side Challenger, where a true star wars geek takes on 22.4 miles of Star Wars Races.. You can also follow Brian on Instagram and on Periscope (@LiveatDisney). I’m excited to welcome Brian back (you may remember him from his Prince’s Perspective on Princess Weekend) to share all the detail of Star Wars Half Marathon Weekend – The Dark Side! 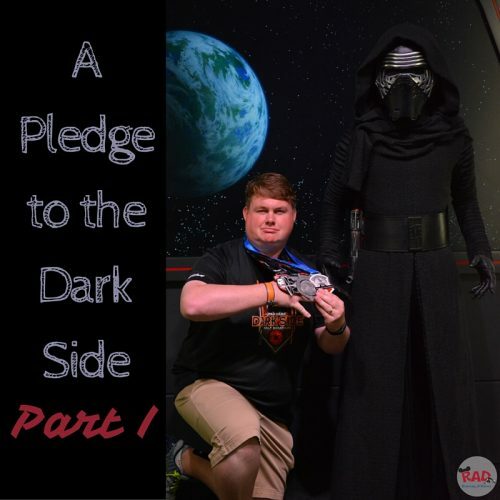 He’s a HUGE Star Wars fan and you can tell he had a blast pledging his allegiance to the Dark Side! 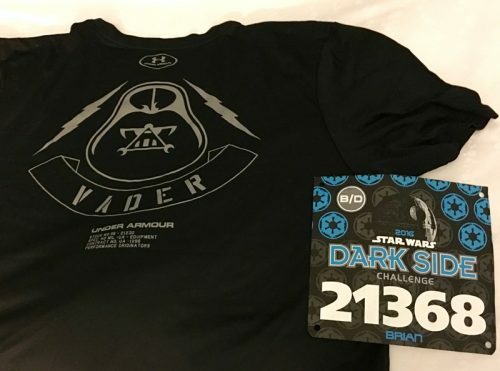 To quote Lord Vader, “Give yourself to the Dark Side”, that is exactly what this avid Star Wars fanboy did at the Inaugural Star Wars Half Marathon. 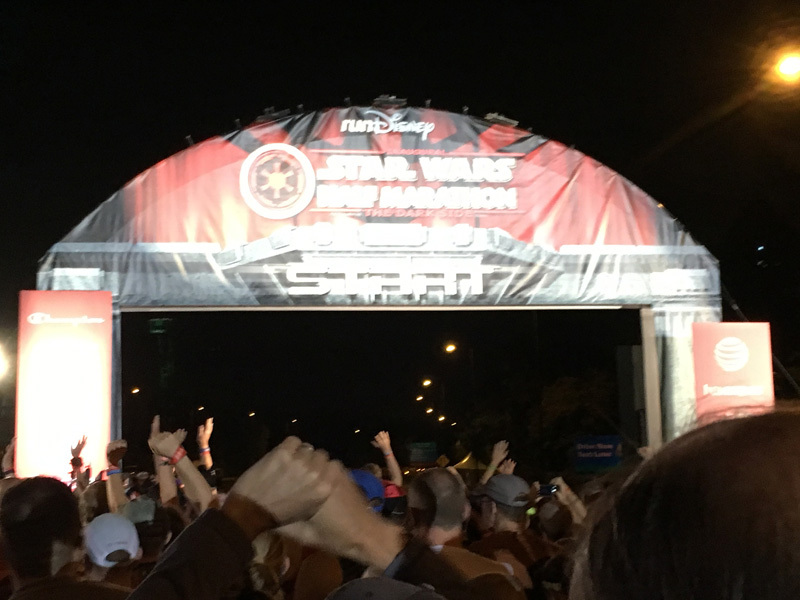 My excitement had been growing exponentially since the race was announced last summer, and leading up to the race my mind was about to explode with pure joy and nerd excitement. 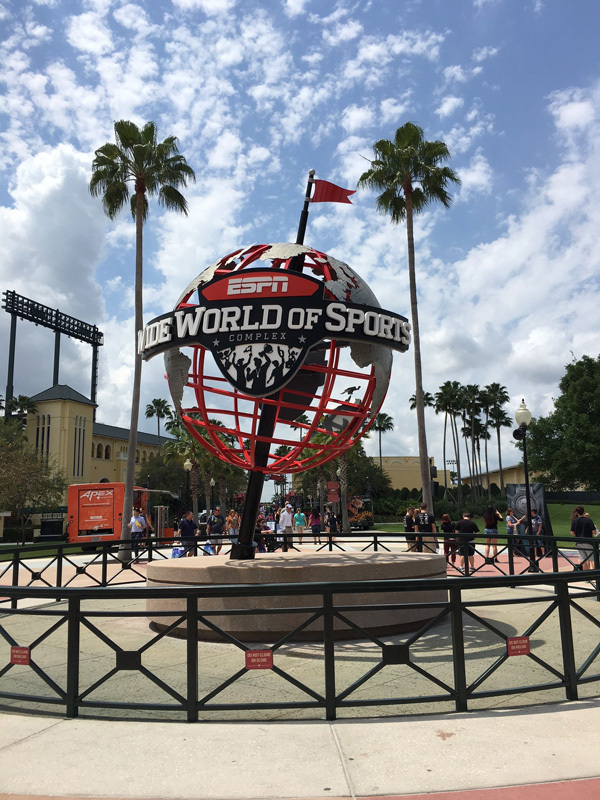 Thursday Morning we woke up extra early, so we would be able to get to the expo before the average nerf herder showed up, we took an uber from Disney’s Art of Animation Resort to the ESPN Wide World of Sports (WWoS). 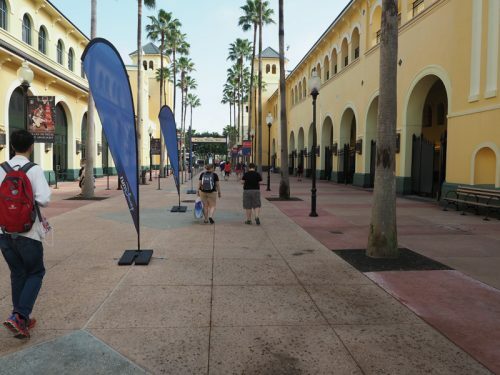 It was a total charge of $4.90 to get over there early, we officially arrived at 8:10am, while Disney Expo Buses didn’t start to leave the resorts till 9:30. 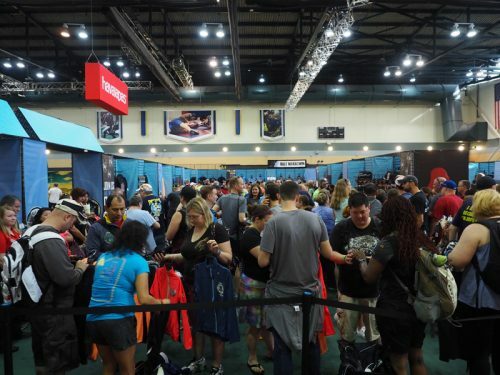 Getting to the expo this early was key since we have seen the most of the really cool merchandise get swallowed up by ebay’ers. 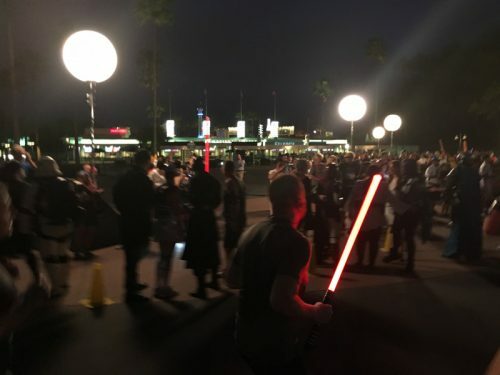 Walking up to the central courtyard of WWoS you could hear the clash of the light saber, the occasional Darth Vader breathing sound, so cool. We knew this race was going to be fun right from the get go. Walking over to the Jostens Center (where the runDisney merchandise was located) we hit a rather usual line, usually we would be around 50 or so to get in, we weren’t even close to that number this time. Disney did something we had not seen yet at any of the many expos we attended, they unofficially opened the doors at 9:00am. 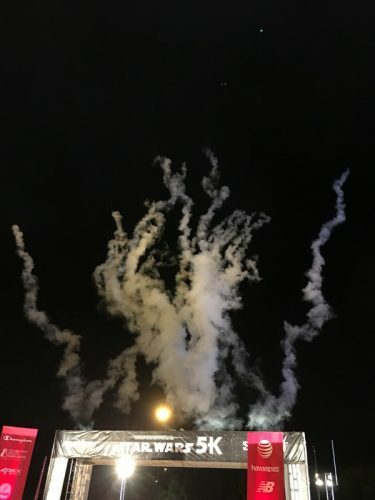 This seemed to really help the flow of people coming and going vs the epic disaster which happened at the Princess expo this year with crowd control. The line moved along without a hitch getting into the Jostens Center, no line break downs at all, everyone seemed to be in a great mood as John Williams score greeted us as we marched forward. Right as we were turning into the building, two First Order Storm Troopers were exiting the Jostens, officially on patrol. Unlike the Princess expo about a month and some days prior, there was no running or pushing to get to the merchandise area. Once in the official merchandise staging area it was a completely different story, just as crazy as the princess. People grabbing, pulling, and would you believe even ripping down fixtures to get the specific items they were on a mission to get. Counted at least 18 people with arm baskets filled breaming with merchandise to go up on eBay later that morning. Lady carrying two baskets filled with all Tervis, probably 30 in each. 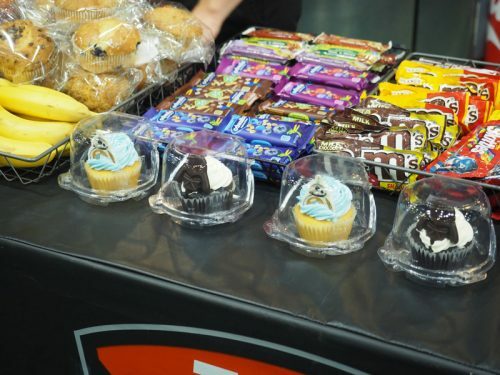 Two guys grabbed half the rack of pins and started to trade for other things they needed, and were very rude about it. Honestly it’s PINS guys! 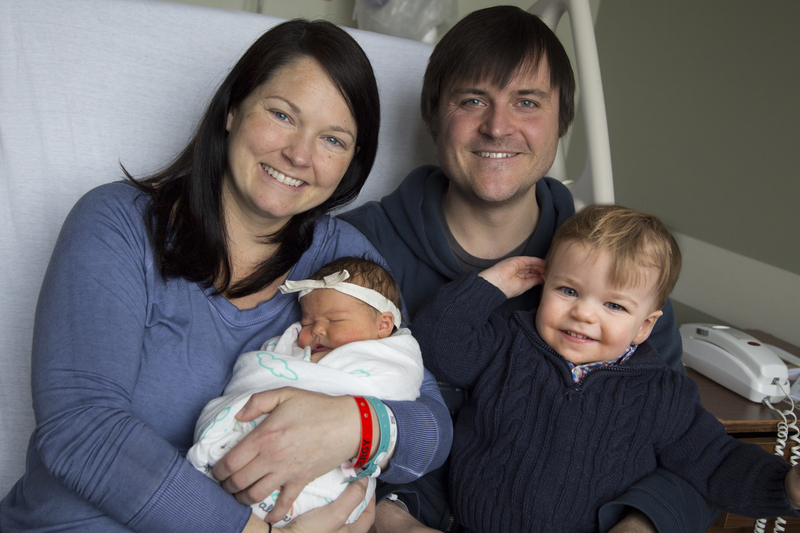 My wife was smart to sit this one out, as much as its fun to be apart of it, its just unnecessary to have to deal with the chaos that ensued. There should be a limit to the number of single items purchased by an individual, this isn’t hard, they’ve done it previously for Star Wars Weekends. Most of the madness was going after the Dark Side jackets and anything Kessel Run Challenge. Once people grabbed various sizes to the items they were hunting, they headed to in front of the cash registers where they would try on and trade with other runners. On my way to the registers, I saw three individuals sitting down going through 9 arm baskets filled with shirts, making sure they had the various sizes they needed for their store. I am a big advocate against eBay people at the expo for one reason only, GREED. 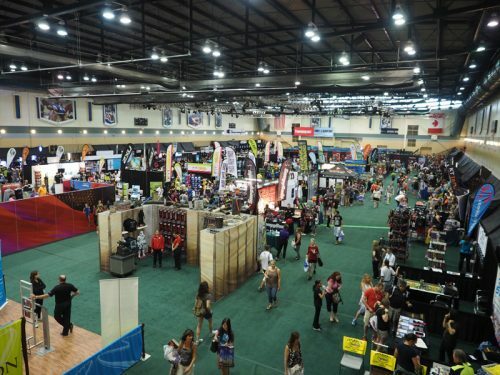 Leaving the Jostens Center, we headed over to the HP Center, where you pick up your bibs for the various races you participate in that weekend. I really wish I had a picture for you, but the process was so stream line and proficient that it took my wife and I maybe all of 10 mins to get all our bibs. Before we knew it we were heading out. 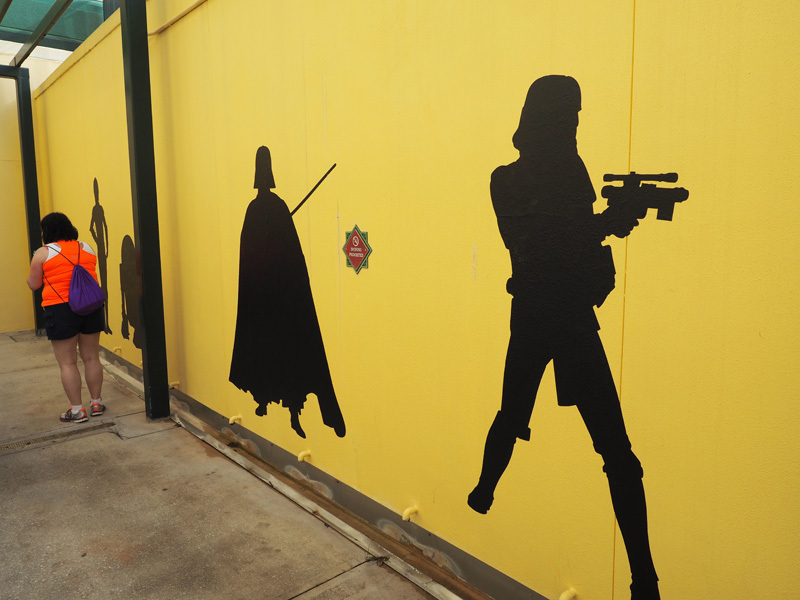 Leaving HP Center, we were treated to some really cool Star Wars silhouettes. 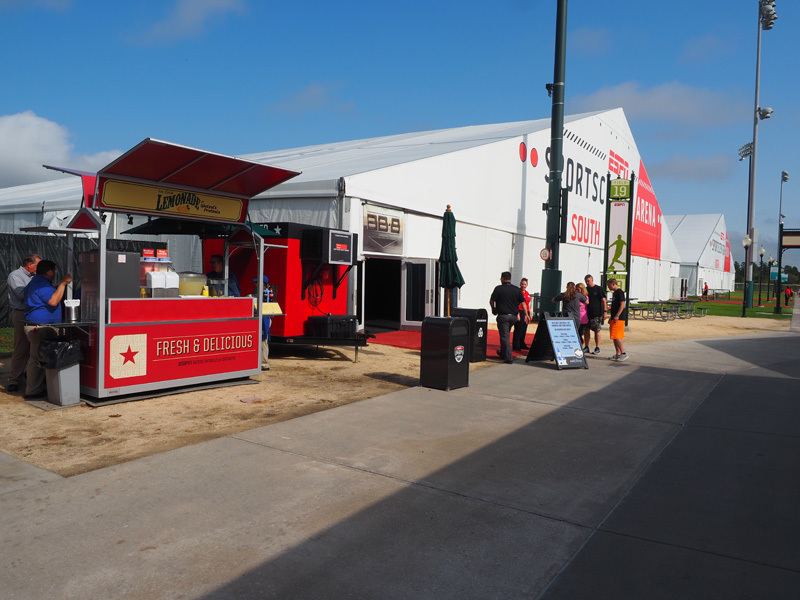 Returning to the central expo courtyard, there was no madness or no crazy lines heading in 6 different directions like at the Princess expo. At this point it was only 9:45am and the resort buses hadn’t really arrived in full force yet. 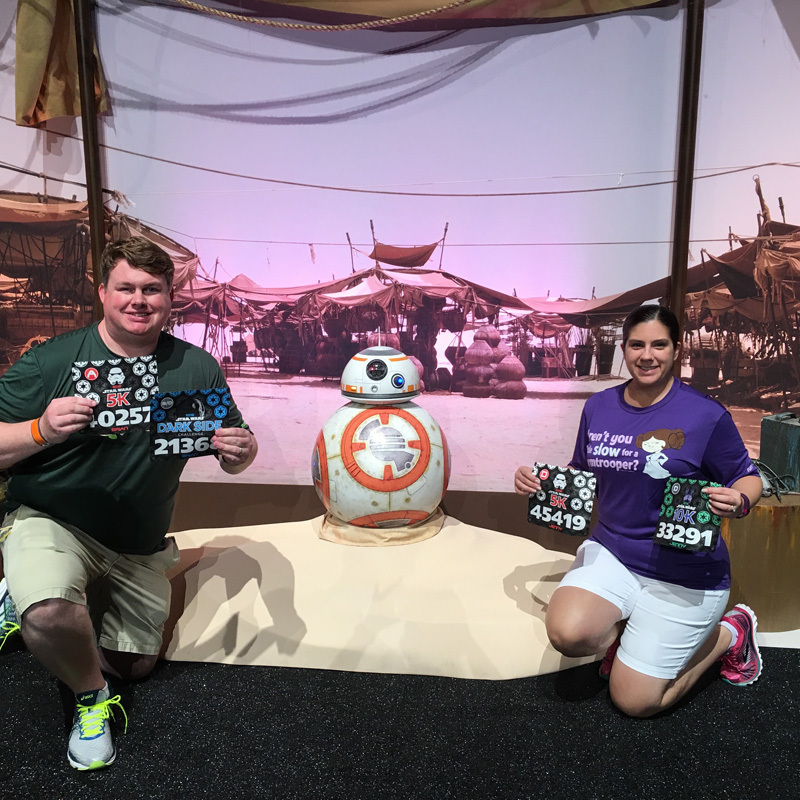 Having heard the announcement at Jostens we knew BB-8 was available for pictures once you had your bib. 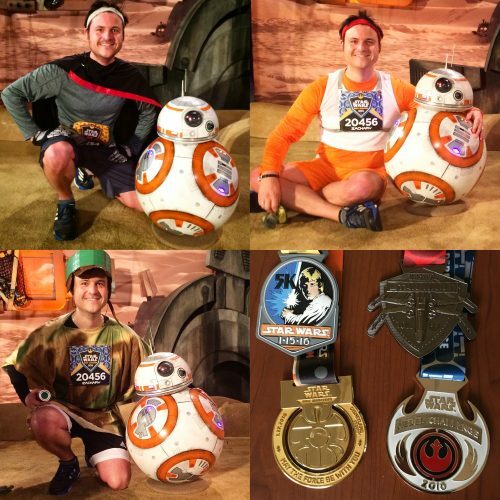 We headed that way, you had to show one race bib to gain access inside the tent featuring BB-8. 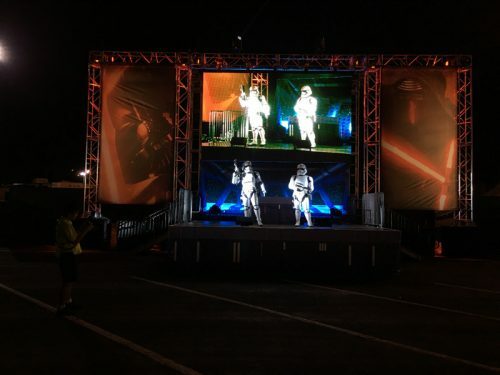 Once inside the tent, Disney had two big televisions playing various clips of Star Wars moments featuring the darker points of the 7 films. 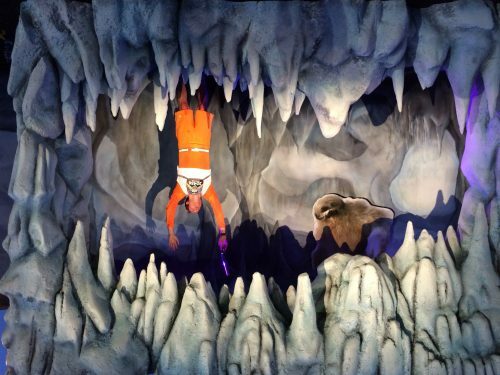 What amazed many of us they actually played a scene from Force Awakens (Spoiler) that Kylo Ren kills Han Solo. With all the little ones, it was a little violent and unnecessary. The line took longer then usual, maybe 20 mins, but it was better than waiting in the upcoming days at the races. Leaving BB-8’s tent we were headed back to the Jostens to pick up Jenny’s race shirts, mine (Dark Side Challenge and 5k) were handed out at HP. The line moved quickly into the expo. Some of Dark Side/Light Side fares available at the expo. Yummy. Jenny got her race shirts (10k) at the Jostens and we were met with a huge line to get into the official merchandise staging area. Wow, we were just there maybe 40 mins earlier. What a difference. 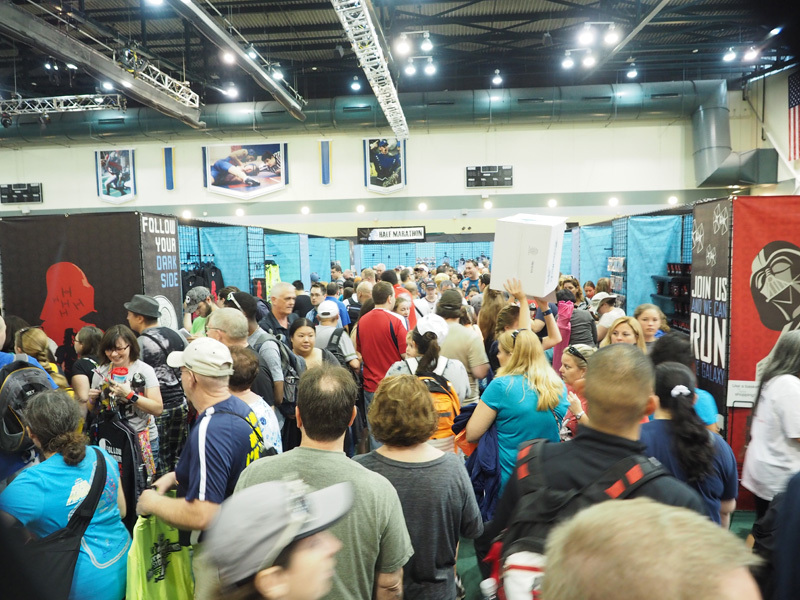 We enjoyed the rest of the expo while most stood in line at the runDisney merchandise area. 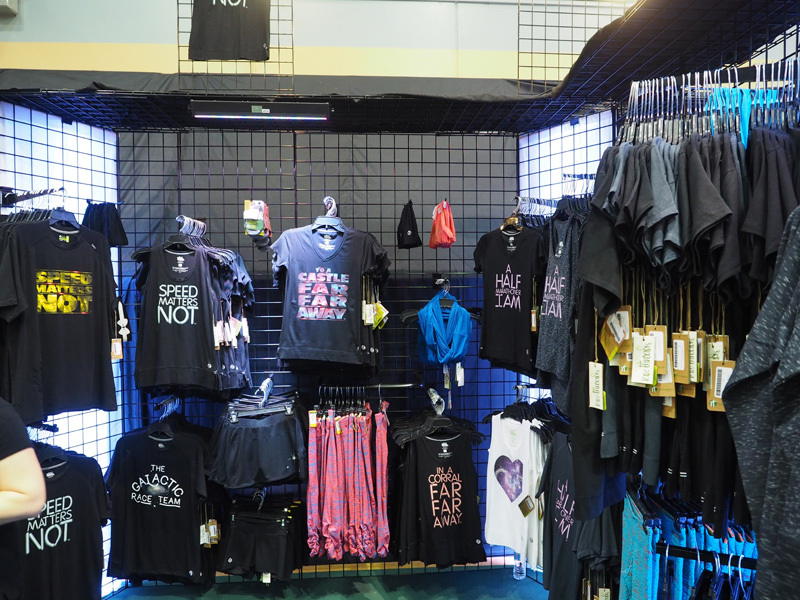 Fit2Run and RawThreads always have great and consistent displays and we always enjoy spending some time looking at the latest and greatest stuff. 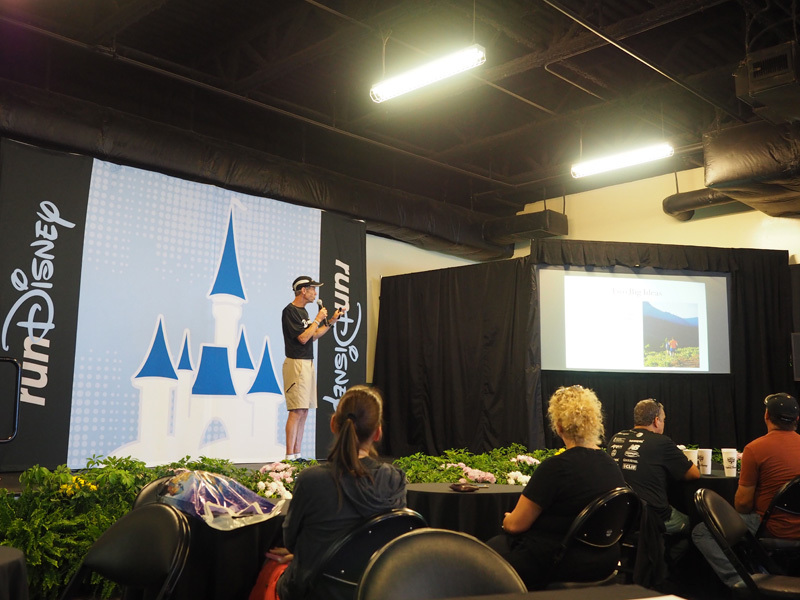 For the first time, we actually got to attend one of Jeff Galloway’s running seminars. 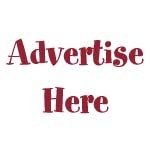 He is one of the best people you can meet and his method really works. Friday Morning hit hard, we arrived at the bus stop at Art of Animation around 4:30am for the buses over to Epcot. Quite a few people were already in line, but it moved fast and efficient. 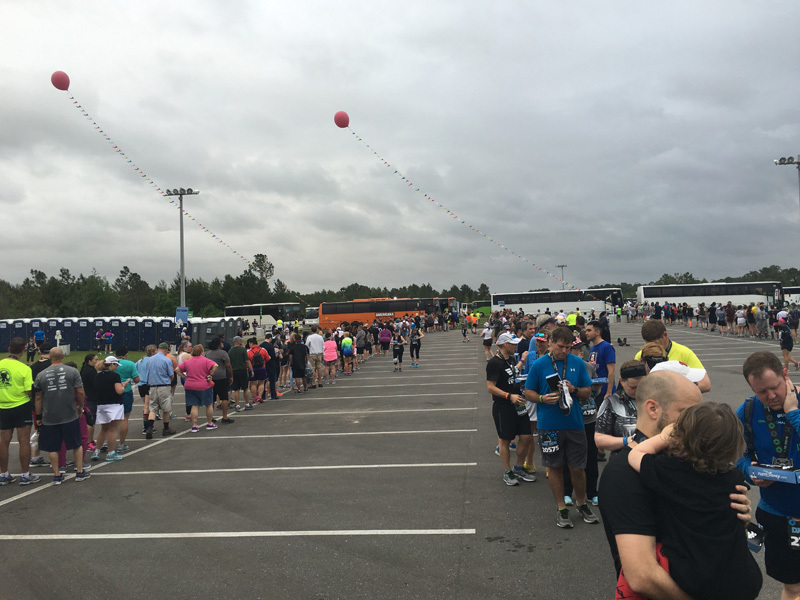 Once we were dropped off at the race staging area, going through security was a breeze. We basically got to the general area as they announced everyone start heading to corrals. My wife Jenny is such a trooper, not the biggest SW fan, but she was so supportive and even dressed up in both races – GO Jenny. Corral A was quickly moved into position and with great fashion the runDisney announcers John, Carissa, and fan favorite Rudy lead the processions in Dark Side fashion. Some First Order troopers came up on stage to let us know, we (the runners) were apart of phase one trials, Captain Phasma was evaluating our skills and may be asked to continue into phase two the next day if we deemed worthy of the Storm Trooper ranks. (Nice touch). They did announce that all the Dark Side characters were going to be available at the end of the race. One of the many characters or stages along the course. Some reviews do such a great job logging specific locations on different mile markers,,,,, Once my corral goes off, I go into competition mode, and don’t really stop that much. 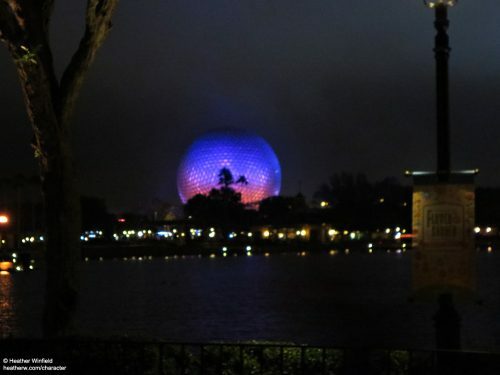 Heading into Epcot (Didn’t take a picture of it, but to my dismay, the World Showcase was lit up in pink, the same color as the Princess weekend. No offense, but that is not a Dark Side color. The course felt exactly the same as the Princess, with a few different characters, one being Chewbacca. (I personally wasn’t going to wait inline 25+ mins for a character that you can get anytime at the Studios). I pressed onward towards the finish. 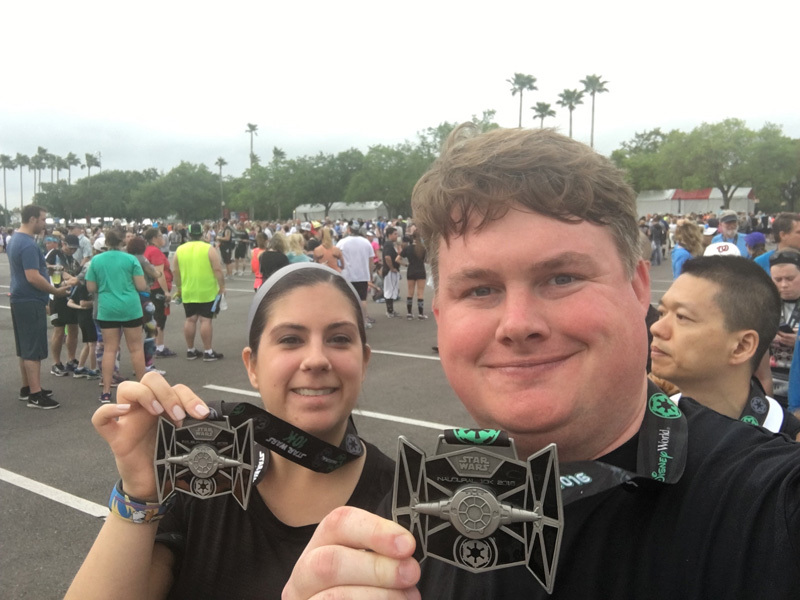 The weather during the race was exceptionally warm with brutal humidity, talked with a few ironman runners in line for Captain Phasma, and they confirmed it was pretty bad out there that morning. Captain Phasma approved me for the second part of this trooper test. What a great character! Stay tuned for Part 2 tomorrow where I take on the Dark Side Challenge! 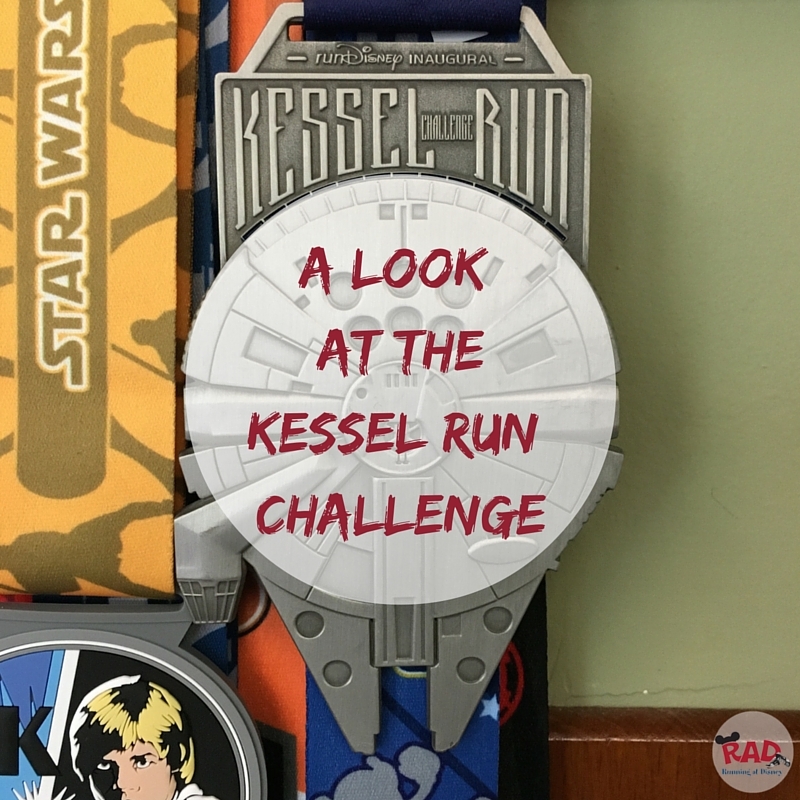 When I first heard about the Kessel Run Challenge, I immediately added it to my bucket list of races to complete. 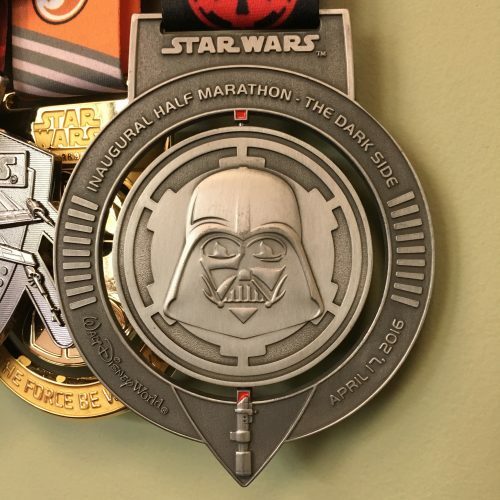 Not only because I love Star Wars, but because the medal is AMAZING! Zach just completed the Inaugural Kessel Run Challenge and is here to share some of the high and lows of both races. Let’s go for a run! Star Wars was my first love. I can’t remember a time when I didn’t know the movies – I immediately fell for the feel, look and spirit of the films. They stuck with me through countless novels, comic books, video games, prequel movies, an animated series, and the exciting announcement – in October, 2012 – that Lucasfilm had been acquired by the Walt Disney Company. 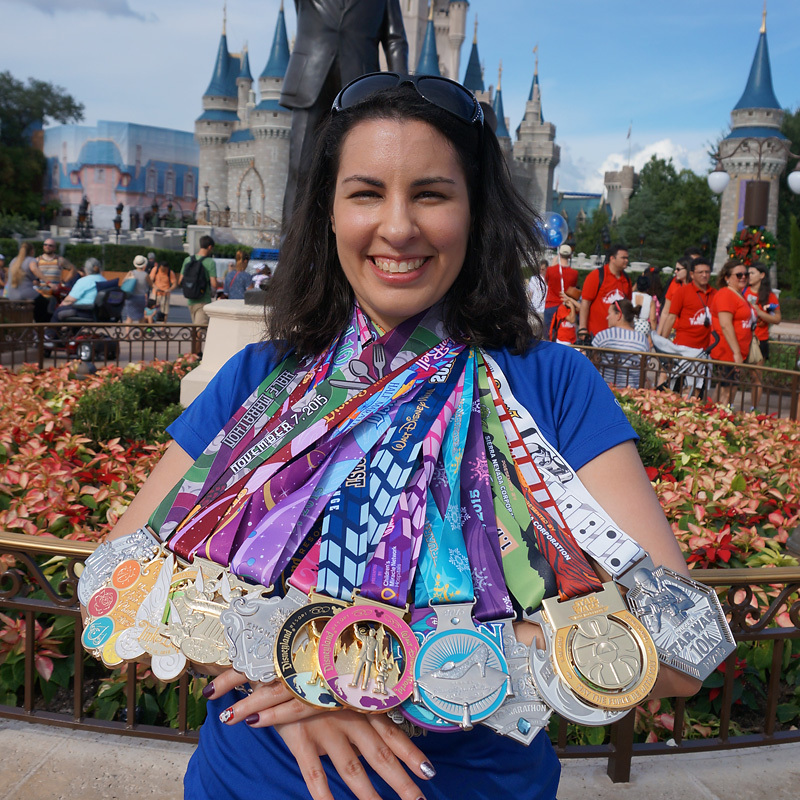 That month I was training for my first marathon and first runDisney event: the 20th Anniversary Walt Disney World Marathon. 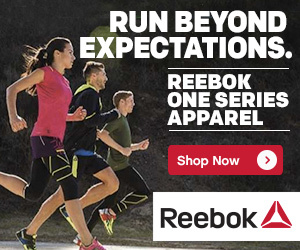 I daydream when I run, and it was hard not to get lost in a galaxy of imagination: What would the new movies be like? 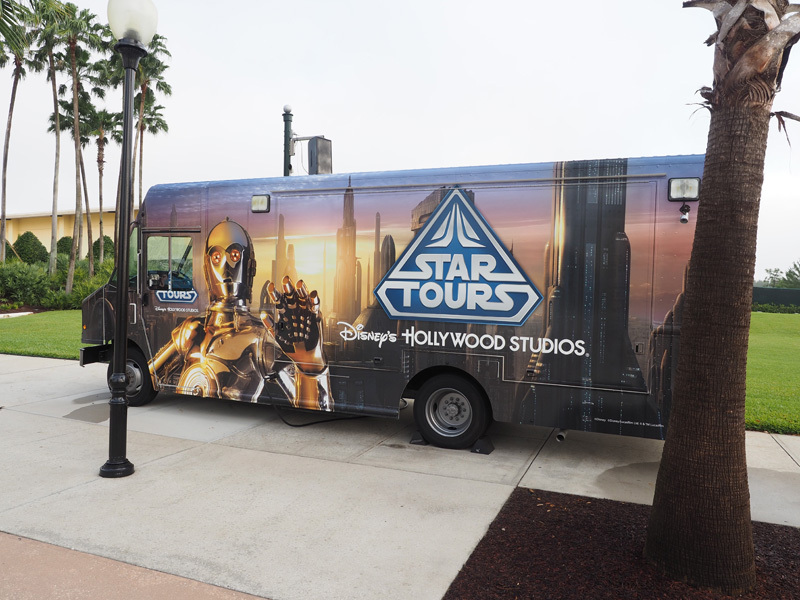 Was Disney planning an expanded Star Wars presence in the parks? 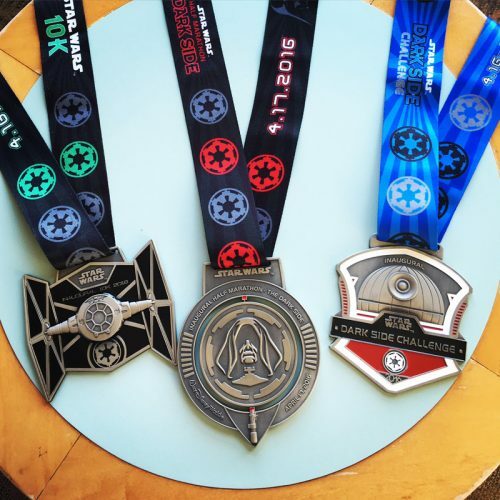 How would it feel to run a Star Wars themed race? That last question was answered in just a little over two years! 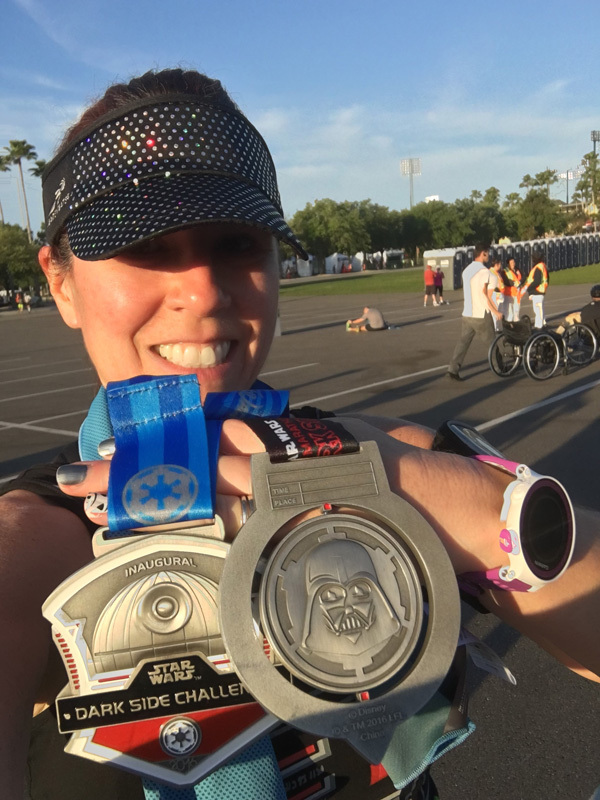 I completed the first two Star Wars Half-Marathons in Disneyland, but I didn’t plan to participate in the inaugural Star Wars Dark Side races at Walt Disney World – I’ll tell you why before I wrap up. 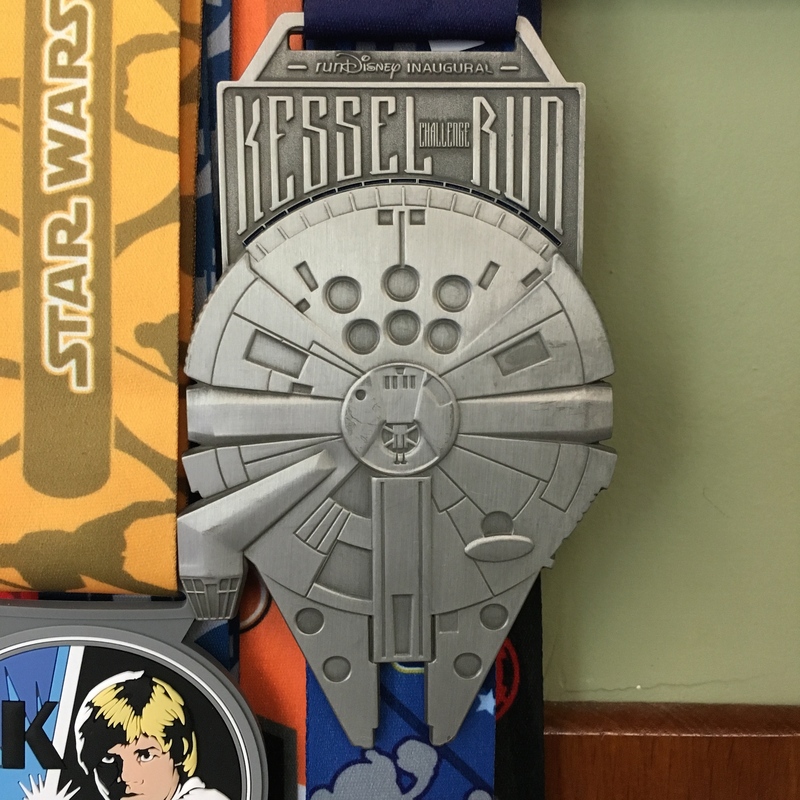 However, when runDisney unexpectedly reopened registration in mid-February 2016, I couldn’t help but sign up for the Half Marathon and see if I could earn the incredibly cool Kessel Run Challenge medal. 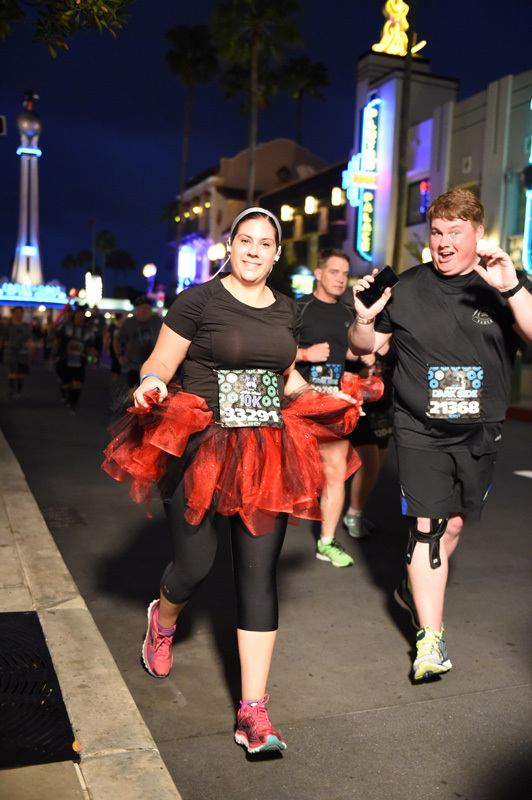 What runDisney has given us are two fun, wonderfully-themed races on fast courses with great entertainment along the way. Each has high points and low points, and I thought it would be helpful to discuss those for the uninitiated in three areas: Course, Entertainment, and Medals. I dare anyone to not love the first five miles of the Star Wars Half Marathon in Anaheim. That portion of the course is almost exclusively through Disneyland and Disney’s California Adventure, or through backstage areas. 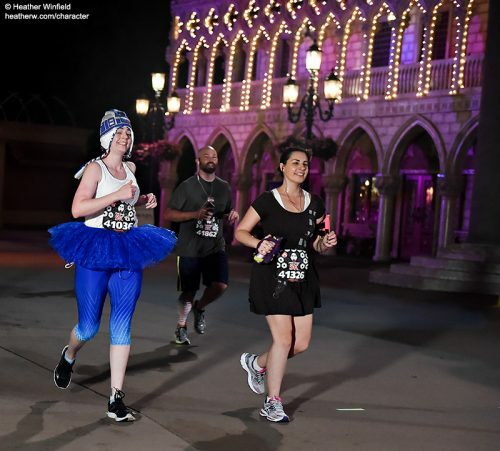 No one has ever written a review of a west coast runDisney course without using the words “once you leave the parks, however…” This course is no different. Around mile 7 it turns through a residential neighborhood as bathrobe’d (NOT Jedi robe’d) residents stumble out to the curb for their morning papers. From there, it gets weirder. At one point during the race I noticed a man in a wheelchair struggling to get up a ramp to the door of an adult bookstore. I instinctively veered onto the sidewalk to help him, but thought again when I realized that – considering I was dressed as Luke Skywalker – it would have been one of the strangest things happening on the planet at that moment. 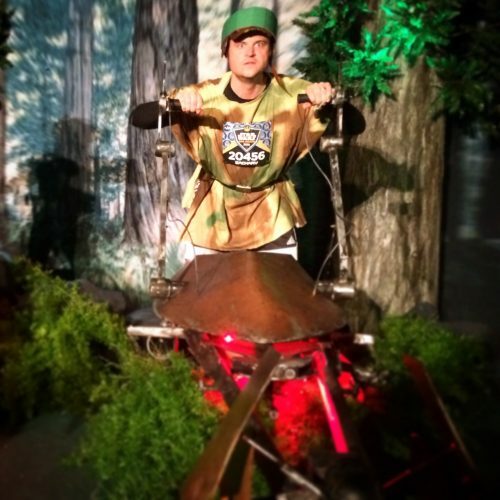 The entertainment makes up for the oddness of the course, and I’ll get into that in the next section. When I signed up for the Dark Side half on the East Coast, the course was not yet public. A little detective work on the runDisney site revealed a start at Epcot and a finish at the ESPN Wide World of Sports complex. 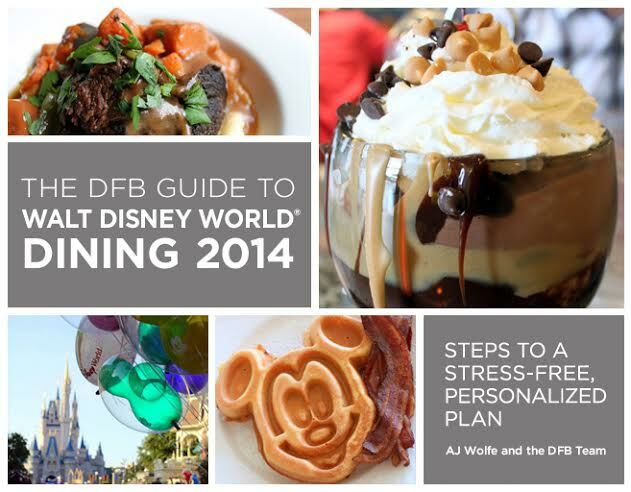 My quick conclusion was that we were getting a reverse Wine & Dine course, and the eventual map release essentially confirmed that, with a few notable exceptions! 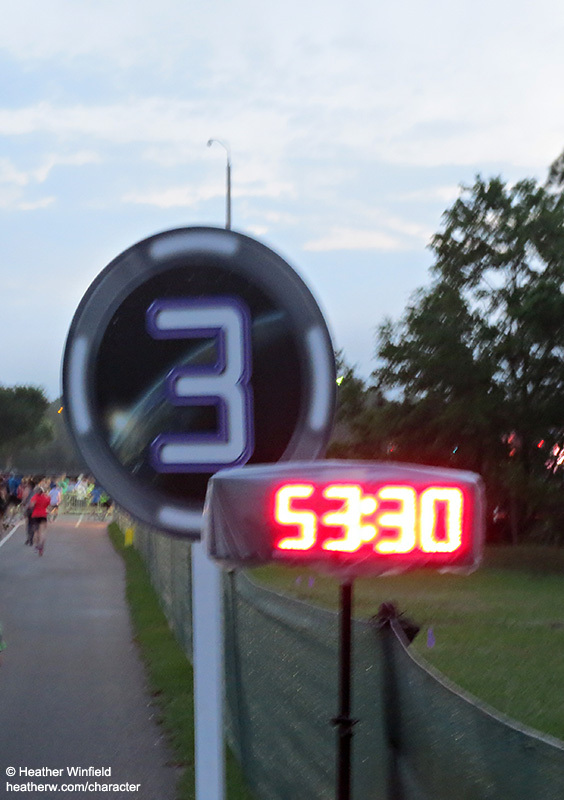 Most importantly – and maybe the highlight of the race – is mile 2 through World Showcase in Epcot. It’s dark. The torches are lit. Other than the music and sound effects it is eerily quiet other than the sound of shoes. After Epcot was the part of the race that had my crowd concern antenna up – the narrow path between the Boardwalk and the ‘Studios. 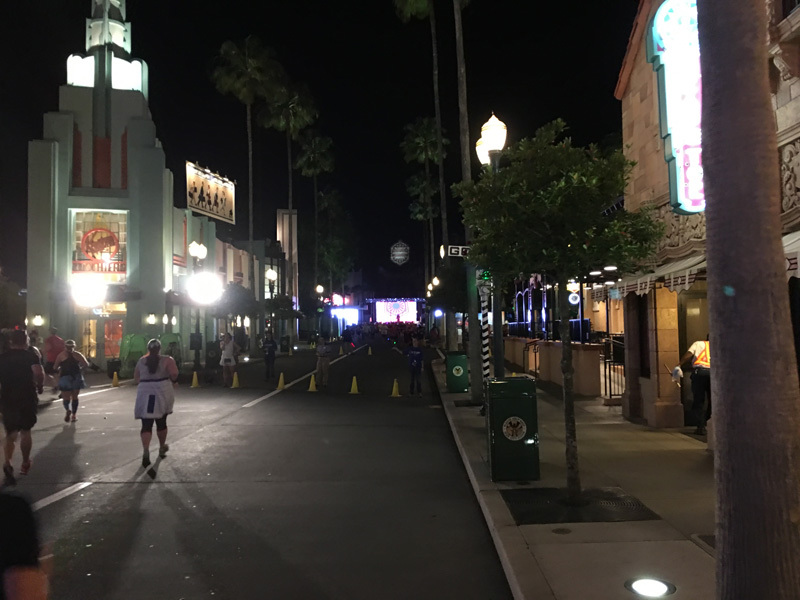 I had heard this was wingtip to wingtip during the 10K, but I thankfully had no problem keeping my pace up into what’s currently left of Hollywood Studios. Animal Kingdom is always a joy to run through in the dark, and then the final surprise of the course was a dirt path into ESPN WWOS off Osceola Parkway that I didn’t know existed! 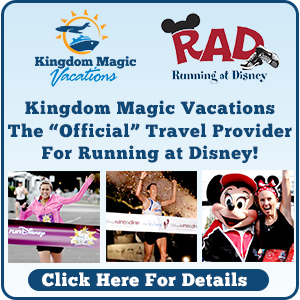 Both courses are flat, fast and offer solid opportunities to run through Disney Parks. What excites me is that they’ll only get better when runDisney can route us through finished, immersive Star Wars lands at each resort in just a few years! Again, the early portion of the Star Wars Light Side Half Marathon really shines. 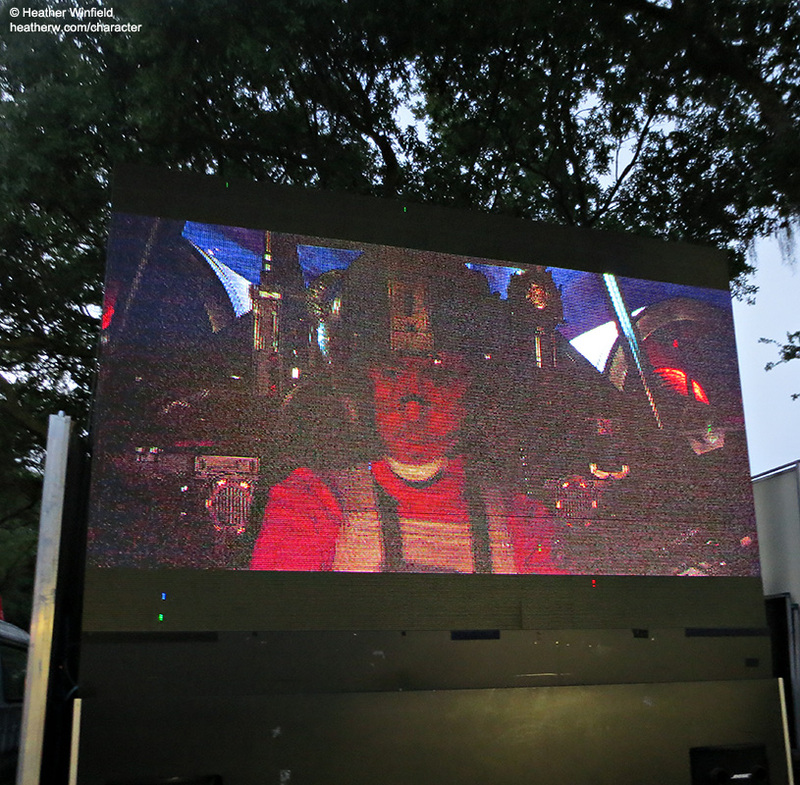 Star Wars music comes from everywhere, and characters are projected stories tall on buildings. The course runs through a tunnel underneath the Disneyland Railroad that has been lit lightsaber red and filled with the ominous sound of Darth Vader’s mechanical breathing. In California Adventure, World of Color lights up Paradise Pier. Several character stops mark the way, the most popular of which this past year was easily BB-8 in DCA. 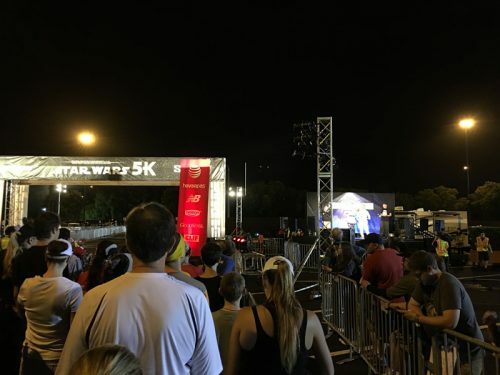 I stopped during the 5K, 10K and the half, and never faced longer then a 5-10 minute wait. Other stops include giant set pieces that allow runners to become part of iconic Star Wars scenes, like the Death Start trash compactor in Episode IV and the Wampa’s ice cave in Episode V.
As I said earlier, the course gets a little weird once it leaves the confines of the parks, but the on-course entertainment keeps the energy going. Several high school marching bands provide music and enthusiasm along the way, especially if you wave a lightsaber at them – I honestly don’t know where these kids get their energy that early in the morning! 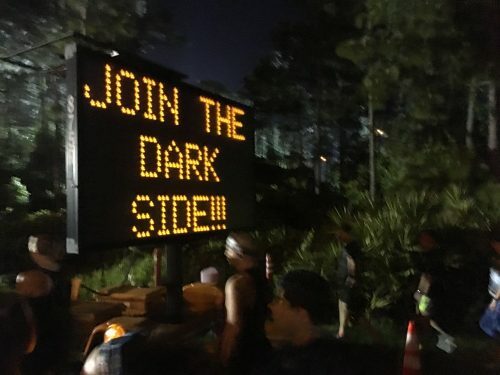 Huge contingents from the 501st Legion, the Rebel Legion, and the Mandalorian Mercs (fan costuming organizations, for those not in-the-know) hold down the course around mile 9, as well as several motorists with vehicles tricked out in a Star Wars theme. I wish there had been more on-course entertainment thereafter on the trip back to the resort, but the promise of a celebratory drink at Trader Sam’s is really all the motivation I need to reach the finish line. I experienced my favorite mile ever in a runDisney event during the Star Wars Dark Side Half, and it was mile two through World Showcase at Epcot. There were no character stops, but Disney used light, music and sound to create an unforgettably atmospheric environment. By the time I reached the China pavilion, I had turned off the music playing through my phone, and was scrambling to make a recording of the ambiance so I’d remember what it felt like: perfect (click here for the recording). Thereafter, I was really surprised by the low number of character stations. I may not be counting accurately, but I remember Chewbacca outside the International Gate at Epcot, Ezra and Sabine from “Rebels” on the way into Animal Kingdom, a second Wookie on the way out of Animal Kingdom, and a few stormtroopers sprinkled around. Instead, many of the most sought-after photo ops were at the start or finish line, including Darth Vader, Captain Phasma and Jabba. That’s very cool for spectators and runners who like to soak up the post-race finish line atmosphere, but there were certainly a few places along the course where a photo op could have broken up a long stretch without a distraction – I’m looking at you, Mile 8 Through The Animal Kingdom Parking Lot. 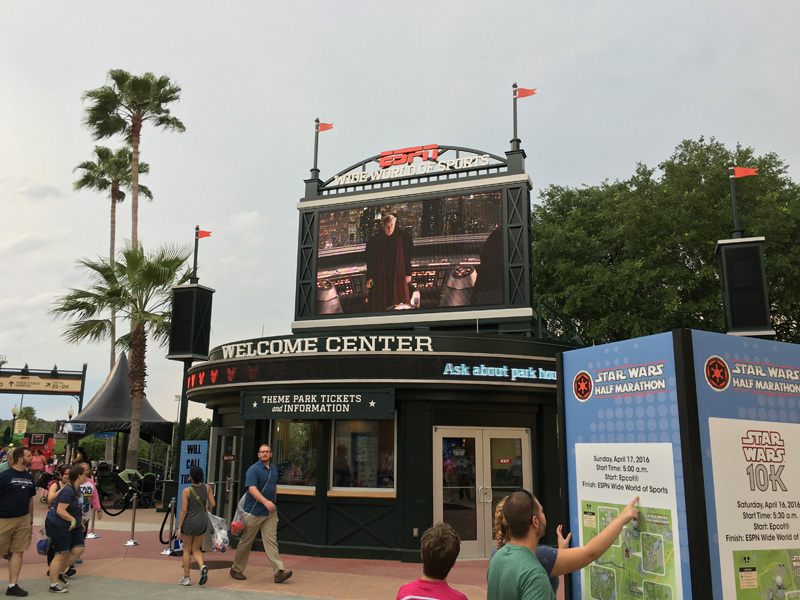 On the less Dark Side, I loved the big screens along Osceola showing various lightsaber duels from the films – very cool! 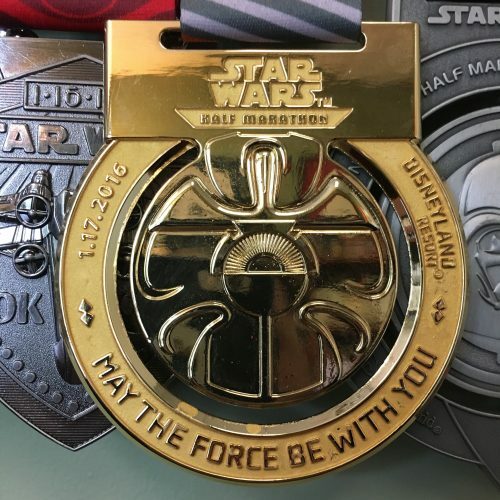 The west coast finisher’s medal is based on the Rebel Alliance’s Medal of Bravery, which is awarded the Luke Skywalker and Han Solo at the end of the original Star Wars movie – that earns it a ton of fan credibility. 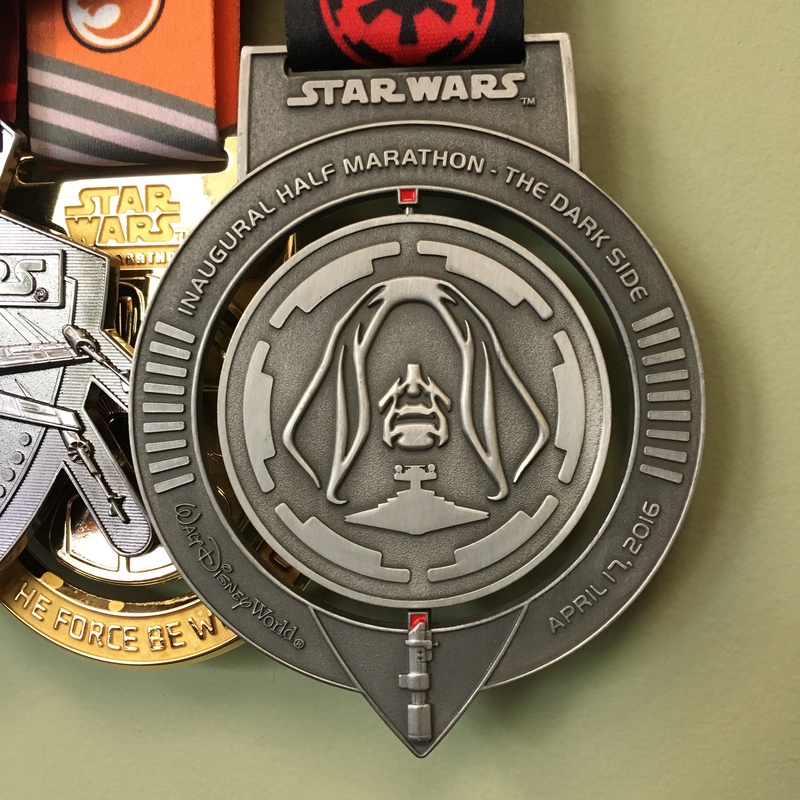 The east coast finisher’s medal features a very cool spinner with Darth Vader on one side and the Emperor (with a semi-hidden Star Destroyer) on the other. Extra points for making the spindle the blade of Vader’s red lightsaber! 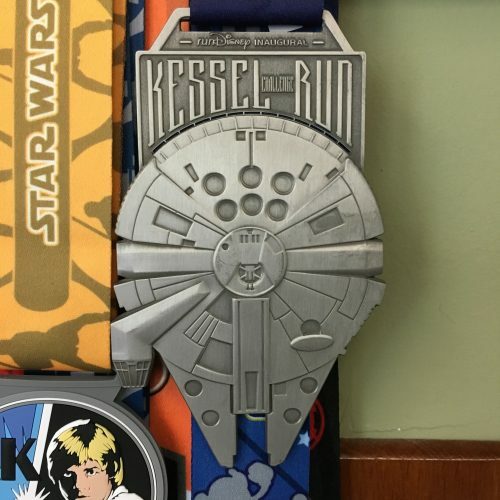 The Millennium Falcon-shaped Kessel Run medal is unbelievable. It is as big as my hand, but thin enough that it isn’t too heavy. In a close race with the 20th Anniversary Walt Disney World Marathon medal, it may be the favorite in my runDisney collection! You can’t go wrong running either of these races, and you certainly can’t go wrong running both of them! 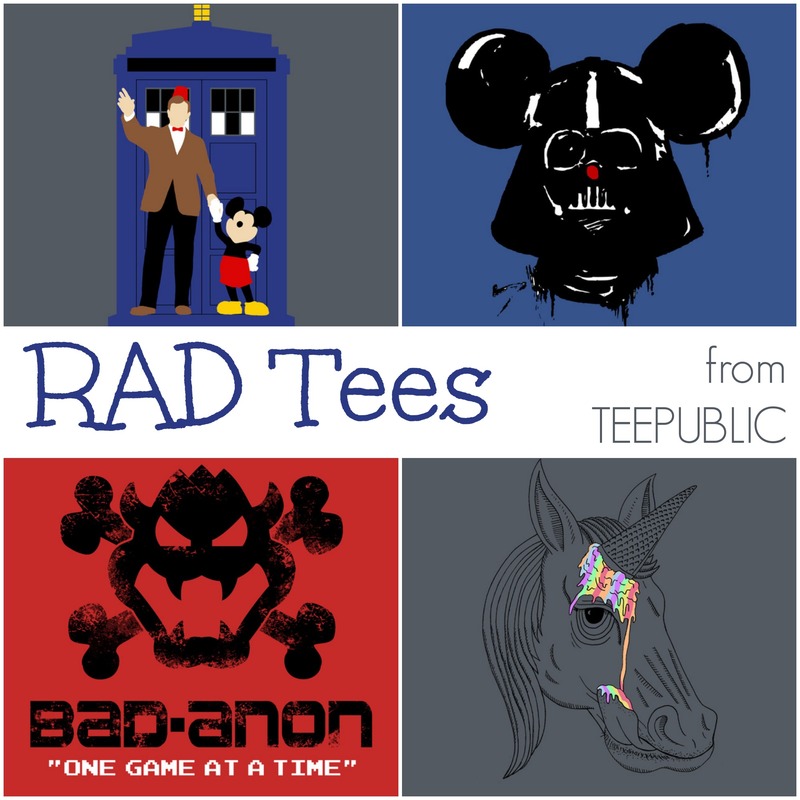 If you’re at all into Star Wars (and who isn’t these days?) there’s a lot of see and get excited about, and as runDisney races they maximize time in the parks and send you back to the showers with a lot of wonderful memories. And I mentioned earlier that I didn’t originally plan to run the Dark Side Half. That’s because my wife and I expected a new baby daughter to arrive exactly a month before the day of the race. I didn’t think I’d be up for too many Father-of-the-Year awards if I skipped the state that soon, but my wife was enthusiastically supportive, and I managed the whole trip from Philadelphia to Orlando and back in just about 38 hours. I want to give an embarrassingly public thanks to Leslie (and Charlie and very new Hadley) for her constant support of my crazy running nonsense! The Star Wars Half Marathon – The Dark Side is definitely on my bucket list of runDisney races for the future. 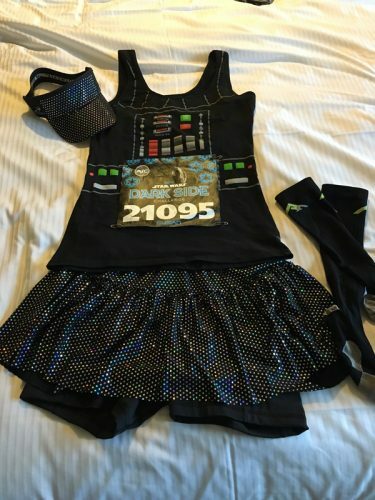 I think even the little one will enjoy dressing up like Darth Vader and running a Kids Race! 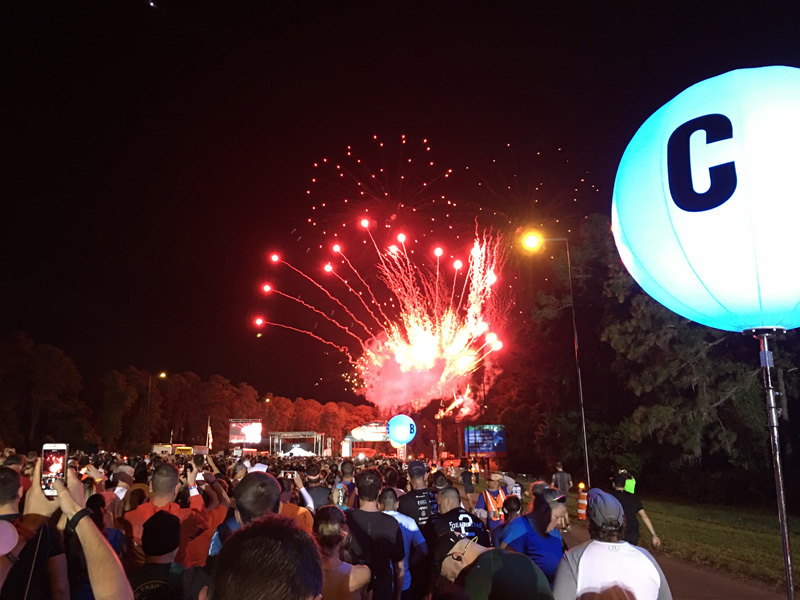 This year, I’m happy to welcome Susan here to give us a great recap of the Inaugural Half Marathon….take it away! 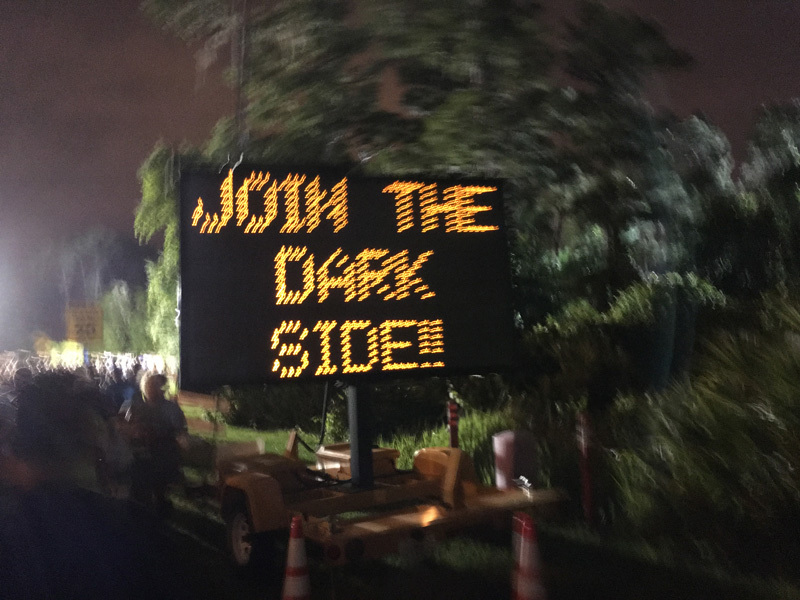 As a huge Sci Fi fan, as well as a veteran Disney runner, I was thrilled when I heard about the Inaugural Star Wars Dark Side Weekend at Walt Disney World. I couldn’t pass it up once I learned it fell on my birthday weekend. 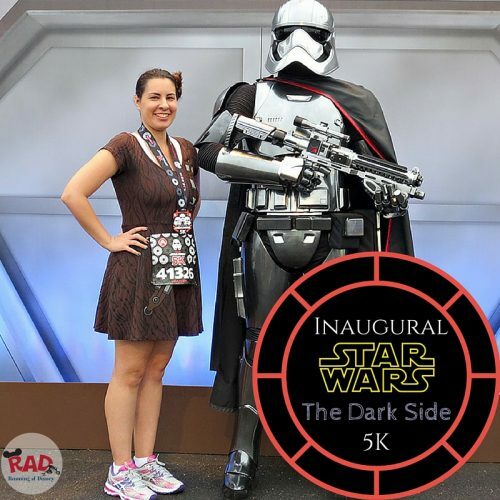 I signed up for the Dark Side Challenge, a 10K on Saturday and Half Marathon on Sunday. Fortunately I trained through a relatively mild New England winter this year and as the date approached, I began to get more and more excited. I flew in to Orlando on Thursday, April 14th in the early afternoon and after quickly checking in to the WDW Dolphin Hotel, I hopped on the shuttle and headed to the Expo at the Wide World of Sports. Star Wars Dark Side was an inaugural race, one that I hope to run many times in the future, and I knew that the Expo would be crowded with people buying commemorative items and Star Wars merchandise. Having run many Disney races in the past, I was familiar with the layout of the Expo. 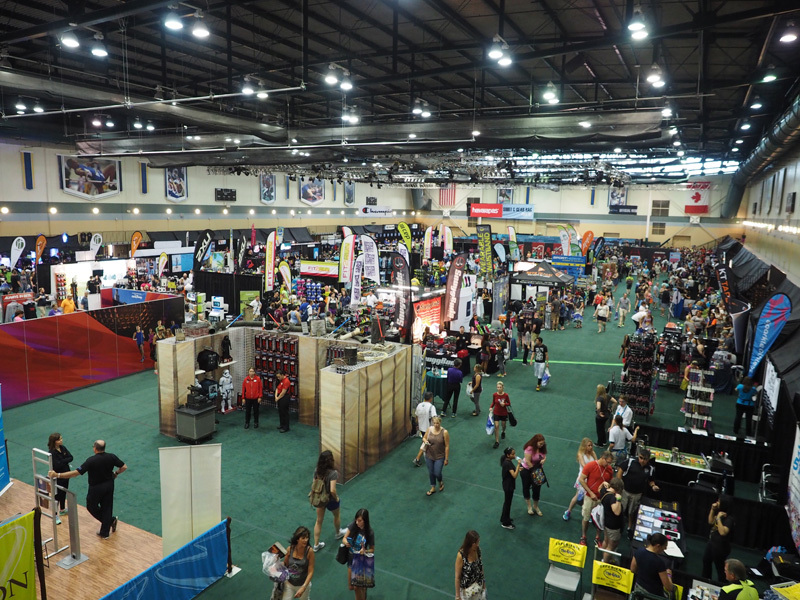 I headed straight for the HP Field House to pick up my bib. 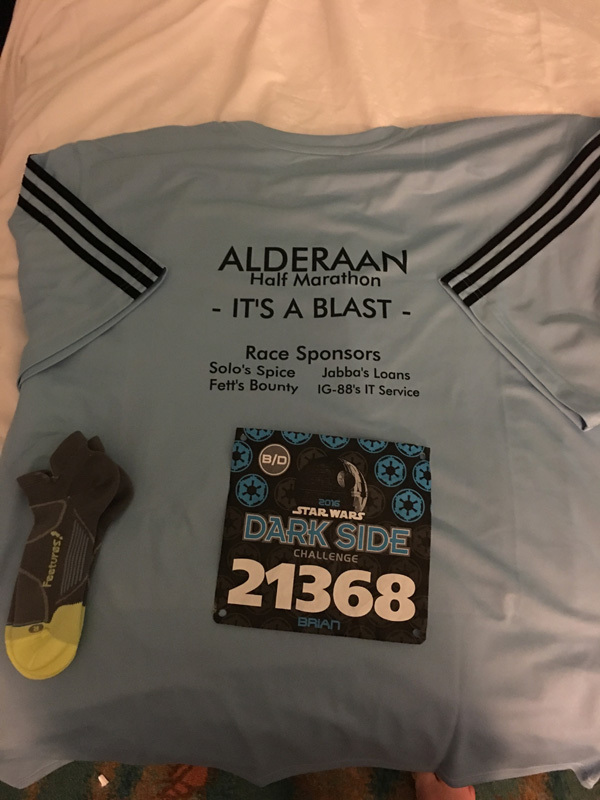 There was no line, I confirmed my info, they took my picture for the Dark Side Challenge medal and I picked up my race shirts. 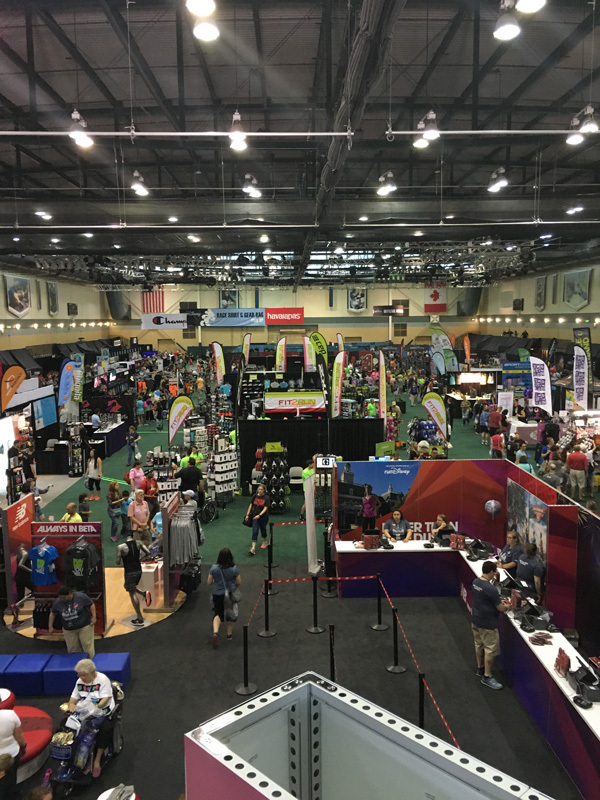 Next, I made my way to the main Expo hall in the Josten’s Center where the exhibitors set up and the majority of the runDisney merchandise is located. I made a quick pass through the items to see what was available and then grabbed a couple of shirts I couldn’t live without. I purchased an “I Did It” t-shirt (I have one from every runDisney event), a Dark Side Challenge t-shirt with Darth Vader and a long-sleeved Dark Side running jacket. Sunday morning would come very quickly. 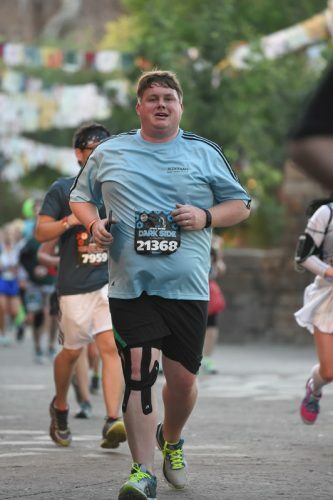 I ran the 10K on Saturday first. The 10K is not part of this write up, but the race was a blast and this picture with Chewbacca ended up being one of my favorite race pictures. After the 10K, we took it easy with no park visits so that I could rest my legs. We had an early dinner of roasted chicken and mashed potatoes and I went to bed to try and get some sleep for the 5:00am race start. I laid out my clothes so nothing would be forgotten. I’ve run quite a few half marathons and typically keep my clothing choices to wicking materials and proper runner’s clothes. 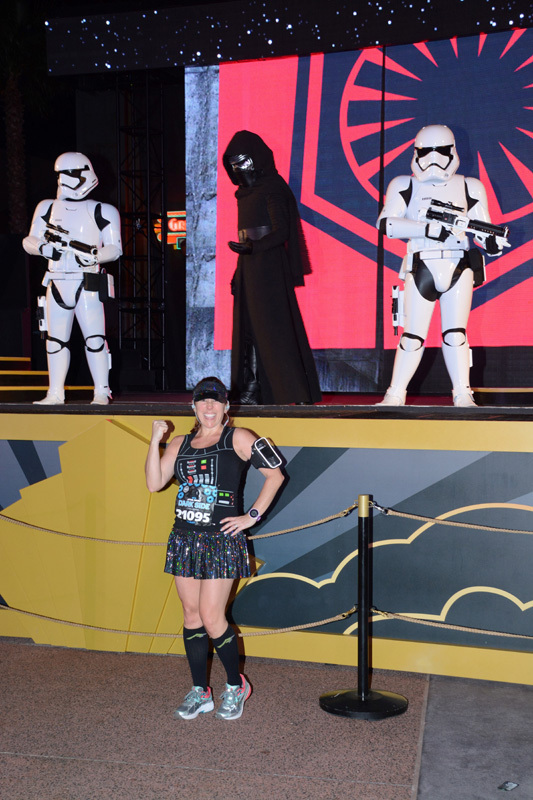 For this run, I dressed it up a little with some sparkle; a visor and skirt from Sparkle Athletic, with running shorts from Lululemon and a Darth Vader tank top. Comfort is key, especially when running 13.1 miles! 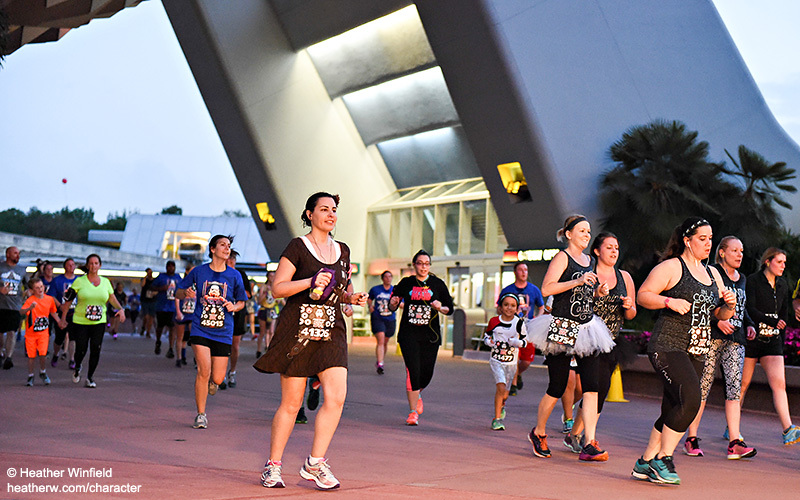 For anyone that has run Disney races, the early start times are the worst thing about the races and 2:30am is a dreadful time to wake up. The alarm went off, I showered, dressed and headed out the door by 3:00am, making sure I had all my running supplies; iPhone, headphones, room key, money and breakfast (a bagel with peanut butter and a banana, along with a bottle of water). 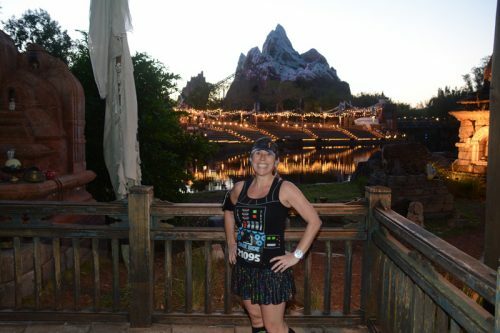 The hotel lobby was full of runners all dressed up in Star Wars t-shirts, hats and all out costumes!! The line for the bus wasn’t too long and within 5 minutes one pulled up to take us to the start in the Epcot parking lot. The sheer number of people who run these races never ceases to amaze me. I believe the final number was more than 18,000 runners. 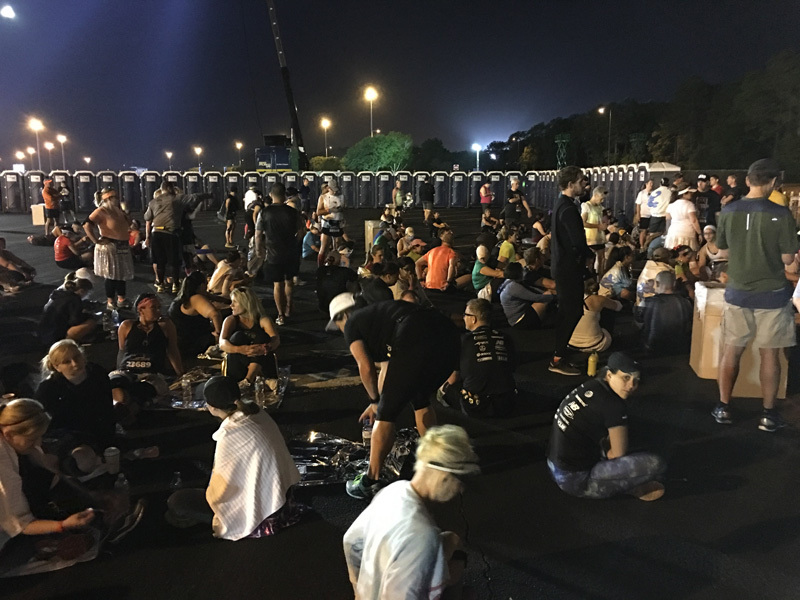 The staging area near the start is always exciting and any sleepiness from the early wake-up fades away with all the liveliness happening. A DJ and an emcee do their best to pump up the crowd. 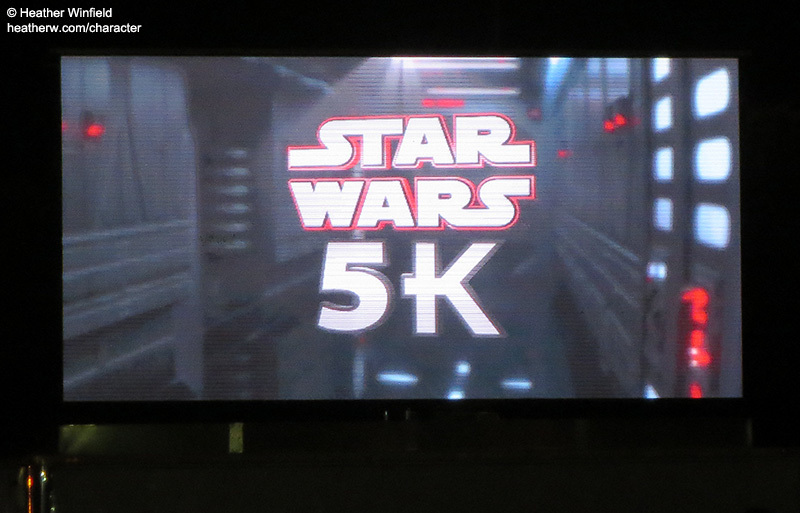 They played scenes from the Star Wars movies on the big screen; they had trivia contests with runners in the crowd and kept everyone informed of the time. 4:00am came and everyone began the long walk to the corrals. Even though it was still pitch black outside, with not even a hint of sunrise yet, people were excited and the energy was palpable. There were many corrals for the Half, A through L. I started in corral C, as I had submitted a proof of time from a previous half marathon of 2:01:35. 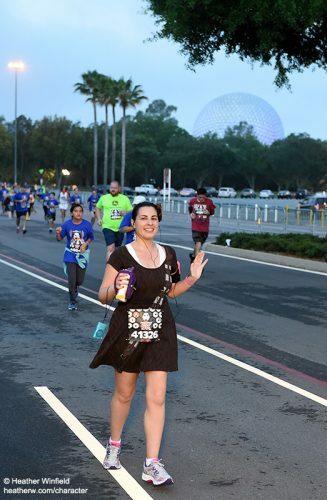 Most Disney runners aren’t running for speed and I knew this would not be a personal best for me, as the heat and humidity would slow my pace, plus I wanted to stop for photos, since this was an inaugural race. 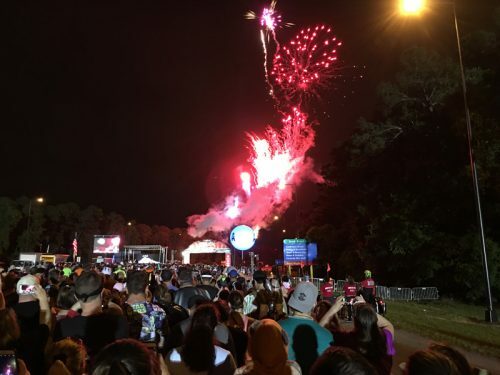 The national anthem was sung, the fireworks blasted and the corral A runners were off! Within a few minutes, it was our turn. I started at a nice easy pace, running with the crowds around me and feeding off the energy. Shortly before mile 1, we were greeted by the sounds of a fantastic high school marching band playing Star Wars music. What an amazing group of kids! R2-D2 was up ahead, but the line was very long, so I kept running. We then made the turn into Epcot and ran through World Showcase. 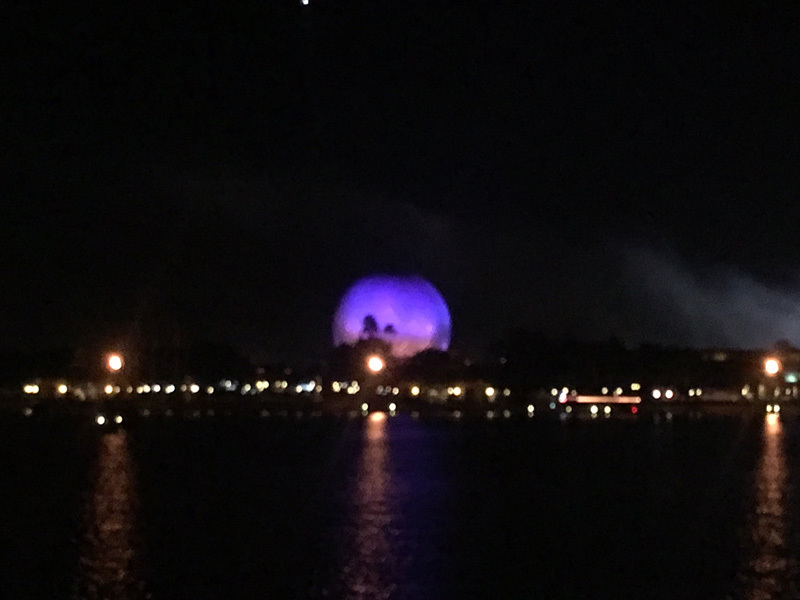 All of the countries were lit up and Spaceship Earth glowed across the lake. We then ran out of the back entrance of Epcot onto the boardwalk past the Yacht and Beach Club Resorts. 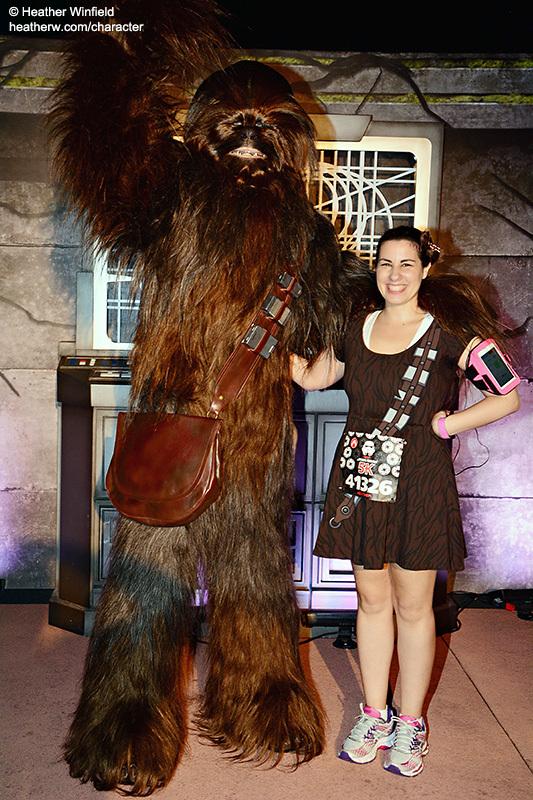 Chewbacca was in the same spot as the day before, but I already had a photo. 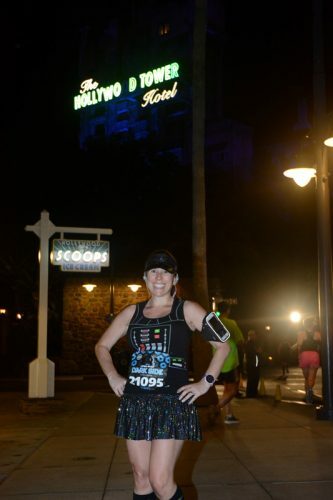 From there, we ran onto the sidewalk behind the Boardwalk hotel leading us to Hollywood Studios. The 501st Legion greeted us as we entered HS. 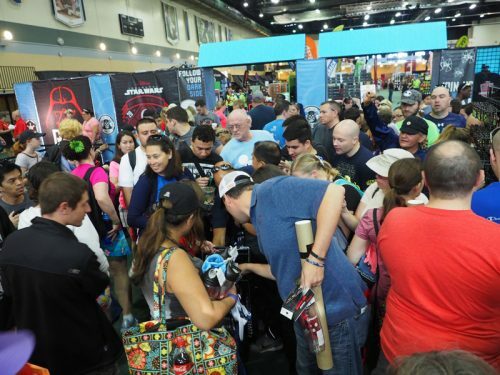 They are truly an amazing group of dedicated, highly accurate, cos-player organization who turned out in droves with Stormtroopers, Sith Lords and many other Star Wars creatures. They provided many photo opportunities for people who didn’t want to wait in the long Disney character lines. 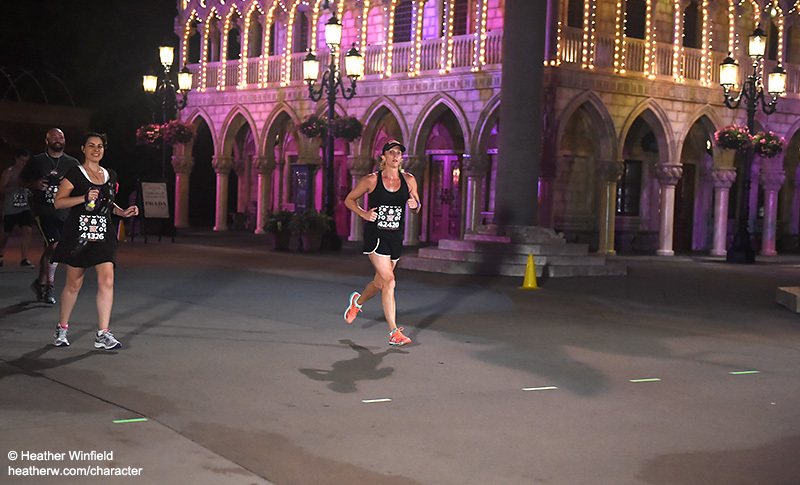 The course continued through Hollywood Studios, to a stage where Kylo Ren was standing with Storm troopers and then a phot0 op in front of the Tower of Terror. We exited HS and headed out for a long stretch of highway before entering Animal Kingdom. There was plenty of crowd support and a DJ set up in the median, although I cranked up my iPhone music at this point and just ran. 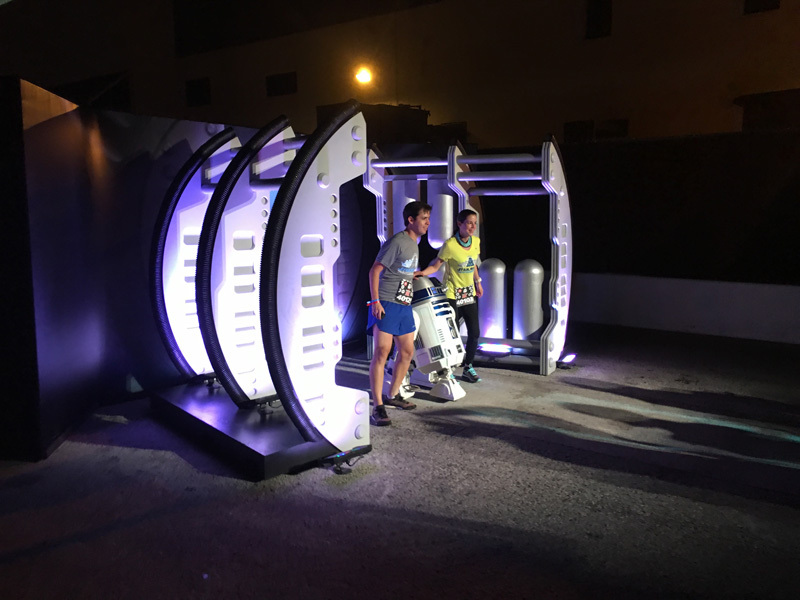 A Wampa cave scene was set up in the AK parking lot, but I had a good running pace going at that point and didn’t stop. We entered Animal Kingdom, ran past Discovery Island and a photo op in front of Expedition Everest. The sun was rising, so the mountain really stands out in the background. There were many more of the 501st in AK and I high-fived as many as I could reach as I ran through the park. And then it was back out to the road again for the long stretch to Wide World of Sports. 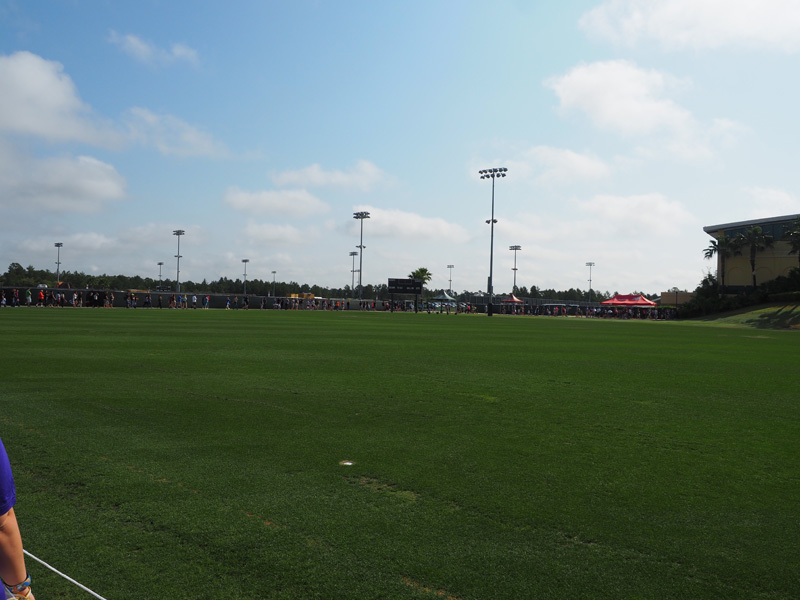 We entered the WWOS complex from the back on a dirt road that leads to the baseball and soccer fields. I loved the softer stretch of dirt as the pounding on the roads is tough on your legs. As I reached mile 12, I was feeling tired but overall pretty good. I came upon Jeff Galloway at this point in the race. He was run/walking with his wife, Barbara. I slowed down to say “Hi” and shook his hand. 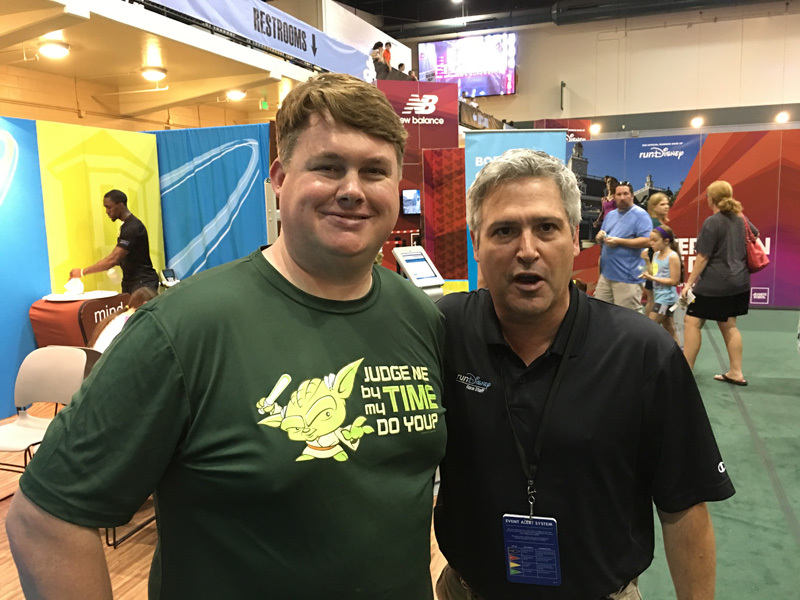 I thanked him for all the help he has given runners over the years. He was so gracious and nice, I almost felt bad about speeding up and leaving him behind! This was definitely a highlight of my race. The end was in sight and I could see the finish line, those medals would soon be mine. Although I didn’t have much left, I ran through the finisher’s chute and raised my arms in triumph, hot and tired, but thrilled. 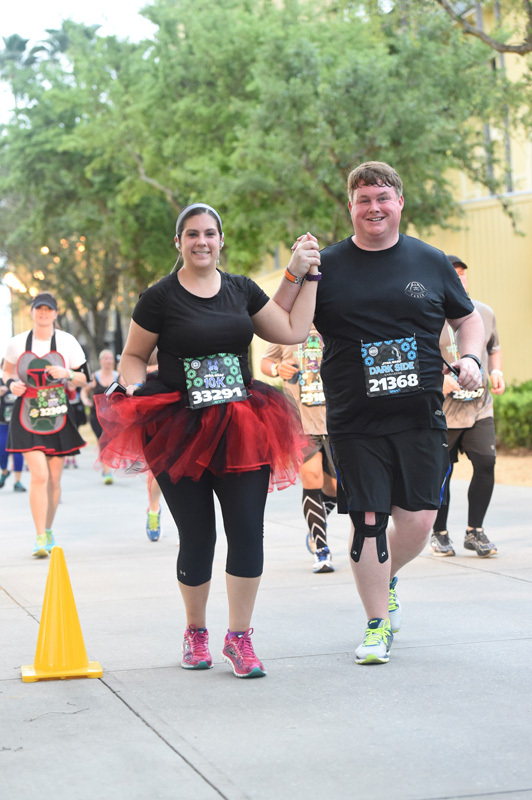 Running back to back races at Disney, paired with the early morning wake-up calls, is pretty exhausting, but it’s all about the bling!! When’s my next race?? 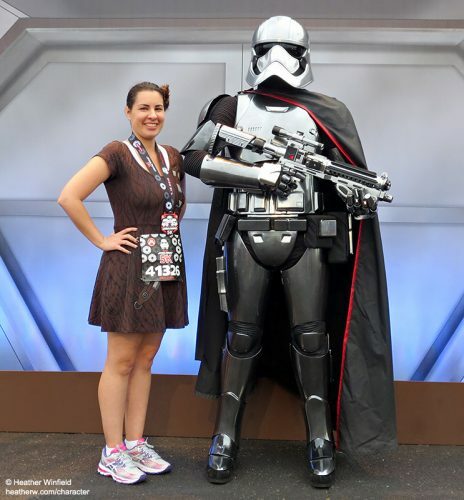 Susan is a mother, a pediatric nurse practitioner, a Disney fan and a runner. She loves sharing her passion for running and a healthy lifestyle with others. Her favorite distances are 10Ks and Half Marathons, but this year she is going to tackle the big one! She’s registered for the Chicago Marathon on October 9th. Let’s wish her luck!! Follow Susan on Facebook, Twitter and Instagram.